Warming patterns are unlikely to explain low historical estimates of climate sensitivity | Climate Etc. A critique of of a new paper by Andrews et al., Accounting for changing temperature patterns increases historical estimates of climate sensitivity. A new paper led by a UK Met Office scientist claims that accounting for the difference in the spatial pattern of surface temperature change between that in the historical period and that projected under long-term CO2-forcing substantially increases historical estimates of climate sensitivity. The claims are based on simulations by global climate models (GCMs) from the UK Met Office and three other institutions, driven by historical (last ~150 years) observations of sea-surface temperature (SST) and sea-ice. The simulations show that the models’ effective climate sensitivity is substantially lower when driven by an observationally-based estimate of the evolution of SST and sea-ice over the historical period than when responding to long-term CO2 forcing. This finding underlies the authors’ conclusion that climate sensitivity estimates based on observed historical warming are too low. The sensitivity of the results to the data used was tested by repeating the simulations by the two UK Met Office GCMs using a more recent SST and sea-ice dataset – an updated and improved version of the dataset that provided the sea-ice data used in the original simulations. The results, which appeared in the paper’s Supporting Information but were not reported in the paper itself, were completely different. The divergence between the simulation results presented in the paper itself and in its Supporting Information show that the authors’ key claim, that climate sensitivity estimates based on observed historical warming are too low, are highly sensitive to the SST and sea-ice dataset used. Results using the more recent dataset contradict their claims, largely due to differences between the two datasets in the evolution of sea-ice more than counteracting the effects of evolving patterns of SST change over the open ocean. I therefore think it is difficult to draw any strong conclusions from the simulation results presented in the paper. that arising from the difference between the spatial pattern over the historical period simulated when GCMs respond autonomously to evolving forcing and the spatial pattern when they are driven instead by a specified, observationally-based, evolution of SST and sea-ice, with unchanging forcing. The first pattern effect concerns forced changes and has been shown to lead to modest (~10%) underestimation of estimated equilibrium climate sensitivity (ECS) for typical current generation GCMs (range -10% to + 50%), although two published studies incorrectly claimed that the effect was much larger. The second pattern effect is only relevant to observational estimation of climate sensitivity to the extent that it is caused by natural climate system internal variability. That extent cannot be major – contrary to what the new paper implies – if current GCMs realistically simulate climate system internal variability. All or part of the second pattern effect might instead be attributable to GCMs incorrectly representing historical forcing and/or the climate system’s response thereto, and/or to inaccuracies in the observational SST and sea-ice dataset used. Soundly-derived recent estimates of effective climate sensitivity (EffCS) based on observed warming over the historical period, EffCShist, have generally been in the 1.6–2.0°C range. That is well below EffCShist estimates for general circulation models (GCMs, also called global climate models) driven by historical forcing, which for current generation (CMIP5) models average 3.0°C (Lewis and Curry 2018). Those estimates are for GCMs with their atmospheric model coupled to a 3D dynamic ocean model (AOGCMs). A new paper (Andrewsetal18) compares “amipPiForcing” simulations by six AGCMs (the atmospheric model components of AOGCMs) with CO2-forced simulations by their corresponding AOGCMs. Two of the AGCMs used were developed at the UK Met Office – where the lead author works – and the remainder at three other modelling centres. Almost all the simulation results have been published previously; this paper brings them together and makes comparisons. The new paper is titled “Accounting for changing temperature patterns increases historical estimates of climate sensitivity”. I consider that statement to be unjustified in the light of the simulation results reported by the authors. In order to show why, I need to go in some detail into pattern effects and what the paper shows about them. The term “pattern effect” refers to the effect on radiative feedback, and on climate sensitivity estimates derived therefrom, of the spatial pattern of evolving surface temperature change. Pattern effects can in general only be estimated in GCMs. In Andrewsetal18, the focus is on the effect on estimated climate sensitivity in GCMs of the difference between the spatial pattern of observed changes over the historical period and that which they project to occur under long-term CO2-forcing. In amipPiForcing simulations (a type of amip simulation), AGCMs are driven by the observed historical (1871-2010) evolution of sea-surface-temperature (SST) and sea-ice, rather than by changing radiative forcing. Since land temperatures are mainly determined by SST, these AGCM simulations involve a similar surface temperature pattern evolution and trend to that of historical climate change observations, notwithstanding that atmospheric composition is set at its preindustrial level throughout, which implies unchanging radiative forcing. Although Andrewsetal18 refer to the effect of the pattern of observed historical SST change, the GCM simulations that they employ are driven by combined SST and sea-ice changes, as is standard for amip simulations. Variation in sea-ice is an important element as it strongly affects local surface temperature and albedo, as well as having remote effects. I treat temperature change pattern effects as including the part of the simulation results attributable to sea-ice changes as well as that attributable to changes in open ocean SST; this is in my view the natural interpretation since the simulations results presented in the paper reflect the strength of the combined SST and sea-ice changes. The paper compares climate feedback (λ) over the amipPiForcing simulations (λamip) with feedback over similar length abrupt4⤬CO2 simulations, in which CO2 concentration is initially quadrupled and then held steady (λ4⤬CO2). The authors find that in the amipPiForcing simulations, feedback is robustly more stabilizing (stronger) than in abrupt4xCO2 simulations. Since effective climate sensitivity is reciprocally related to feedback strength (|λ|), the related amipPiForcing EffCS estimates, EffCSamip, are smaller than those derived from the abrupt4xCO2 simulations, EffCS4⤬CO2. In the abstract to Andrewsetal18, EffCS is used to refer to effective climate sensitivity as derived from warming and radiative changes over the historical period (EffCShist), while in section 2 of the paper EffCS is used to refer to that estimated from regression over years 1-150 of abrupt4⤬CO2 simulations (EffCS4⤬CO2), which the authors use as a proxy for long-term climate sensitivity. Comparing, as Andrewsetal18 do, EffCSamip with EffCS4⤬CO2 rather than with EffCShist conflates two conceptually distinct pattern effect issues. The first issue concerns the effect in GCMs on feedback strength, and hence on EffCS, of the difference between the simulated spatial pattern of temperature change in response to long-term CO2-forcing and that simulated in response to evolving forcing over the historical period. There is no good evidence that this pattern effect is reduced if the evolving composite forcing during the historical period is replaced by smoothly increasing CO2-only forcing. Rather, this pattern effect is dominantly related to the time elapsed since forcing was applied. This time-dependent pattern effect is relevant to estimation of the difference in AOGCMs between EffCShist and true equilibrium climate sensitivity (ECS), as approximated by EffCS4⤬CO2 or otherwise. Observed warming plays no role in it. The second pattern effect issue concerns the effects on EffCS estimates in GCMs of differences between model-simulated forced warming patterns and observed warming patterns over the historical period (from the third quarter of the 19th century until recent years). That is reflected in the difference between EffCSamip and EffCShist. It may be relevant to comparing estimates of ECShist based on observations and on forced GCM historical simulations. Since historical forcing was not generally diagnosed in CMIP5 models (and evidently differs considerably between them), their responses to comparable duration CO2-only forcing are typically used to estimate their ECShist. As it is not central to my main criticism of Andrewsetal18, discussion of differences between ECShist and long-term climate sensitivity estimates in AOGCMs appears in an appendix (Appendix A). However, in order to provide more relevant comparatives, I include λhist and ECShist estimates in Tables 1 and 2 in addition to the EffCS4⤬CO2 values given by Andrewsetal18. The λhist and ECShist estimates are derived from regression over the first 50 years of abrupt4xCO2 simulations, which provides satisfactory values for them and can be calculated for all six AOGCMs. Andrewsetal18 examines estimates of the climate feedback parameter λamip operating over 1871-2010 in amipPiForcing simulations by eight AGCMs, each driven by the AMIP II observationally based SST and sea-ice dataset. They estimate λ as the slope of an ordinary least-squares (OLS) linear regression fit (with intercept) of planetary radiative imbalance (N) on global surface temperature (T), using annual mean data, as is common. They compare λamip with λ4⤬CO2, the latter reflecting the OLS regression fit over years 1-150 of the abrupt4xCO2 simulation. Their long-term climate sensitivity estimate, EffCS4⤬CO2, is derived from the same regression line, by halving its x-intercept. They compare EffCS4⤬CO2 with EffCSamip, derived as EffCSamip = F2⤬CO2 / |λamip|), F2⤬CO2 being an estimate of the forcing from a doubling of preindustrial CO2 concentration. This derivation is valid provided that the F2⤬CO2 estimate represents an effective radiative forcing (ERF). For the six models where comparison was possible, they find that feedback strength is much higher in the amipPiForcing simulations, resulting in a climate sensitivity estimate that – based on the F2⤬CO2 values they use to convert λamip to EffCSamip – is on average 40% lower than their long-term value. However, Andrewsetal18’s EffCSamip value is reached by dividing |λamip| into an estimate of F2⤬CO2 derived from regression over years 1-150 of abrupt4xCO2 simulations. Such an estimate of F2⤬CO2 does not correspond to the ERF involved where, as is normally the case, λ changes over years 1-150 of the abrupt4xCO2 simulation; indeed, is has no physical interpretation (see Box 1). Accordingly, EffCSamip values should not be derived using such F2⤬CO2 estimates. I show corrected EffCSamip values that use F2⤬CO2 estimates derived from regression over years 1-50 of abrupt4xCO2 simulations, which are little affected by changes in λ. That F2⤬CO2 estimate is a good measure of ERF, and on average agrees with the F2⤬CO2 estimate from a model that uses accurate radiation codes. Using the estimate of F2⤬CO2 derived from regressing over years 1-50 of each GCM’s abrupt4xCO2 simulation to convert its λamip estimate to a corresponding EffCSamip value is therefore an appropriate choice. That F2⤬CO2 value is moreover the one implicit in the relation between our estimates of λhist and EffCShist. Table 1 is a version of Andrewsetal18 Table 1, with the corrected EffCSamip values referred to above, that includes the six models for which all the necessary data is available; CAM5.3 and GFDL-AM4 are omitted since no estimates of any EffCS values were given for those models. The resulting mean EffCSamip value is 34% below the (unchanged) mean EffCS4⤬CO2. 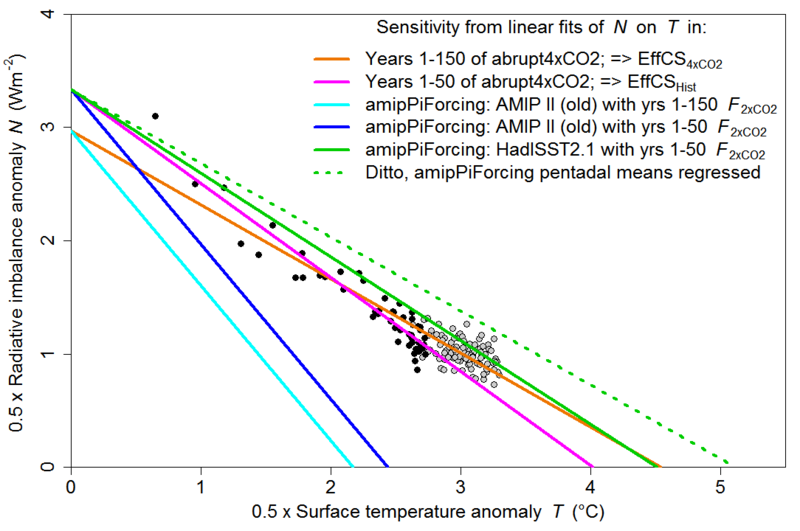 Since the Andrewsetal18 λ4xCO2 values can only be converted to a climate sensitivity using an unphysical F2⤬CO2 value, I have replaced them with λhist, estimated as stated above, which is in any event a more appropriate comparative for λamip. It is clear from Table 1 that, even when comparing λamip with an estimate of λ corresponding to that derivable from historical period information (λhist), all six models show a noticeably stronger climate feedback (λamip ) – and hence a correspondingly lower EffCS (EffCSamip) – over the historical period when driven by observationally-based SST and sea-ice evolution than when allowed to generate their own SST and sea-ice patterns in response to radiative forcing (λhist and EffCShist). Their estimated long-term climate sensitivities (EffCS4⤬CO2) are higher still, but on average they exceed EffCShist by only 8%. Do the amipPiForcing simulations justify the key claim in Andrewsetal18? that the long-term SST and sea-ice patterns simulated by AOGCMs, and the radiative response to them are realistic. In the paper’s Abstract, the key claim made in the paper is qualified as dependent on the assumption that point 3 is true. However, in its title and its final section no such qualification is made. Points 1 and 2 are elaborated upon in the following sections. Observational estimates of patterns of SST and sea-ice are inevitably more uncertain, particularly during the first half of the historical period, than estimates of global mean surface temperature, which are all that historical period energy budget based climate sensitivity estimation requires. The AMIP II SST and sea ice dataset used for the amipPiForcing simulations analysed in the paper was developed some time ago; for sea ice it essentially reflects HadISST1, a dataset originally released in 2003. In 2014 the sea ice component of an improved dataset, HadISST2.1, that used new data sources that had become available and applied bias adjustments, was released, followed more recently by the SST component. Therefore, the sensitivity of the results to a change of SST and sea-ice dataset can be tested. Andrewsetal18 very appropriately investigated, in their Supporting Information, whether the amipPiForcing results were robust to different datasets by carrying out further simulations with the two UK Met Office models, HadGEM2 and HadAM3, using the more recent, improved, HadISST2.1 dataset. Using Andrewsetal18’s 30-year sliding window regression method, variation in feedback strength in HadGEM2 spans a similar range when driven by HadISST2.1 SST and sea-ice as when driven by the older AMIP II datasets that uses HadISST1 sea-ice (Figure 1). However, regression analysis using a 30-year sliding window gives a misleading impression of feedback in HadGEM2 over the full period. 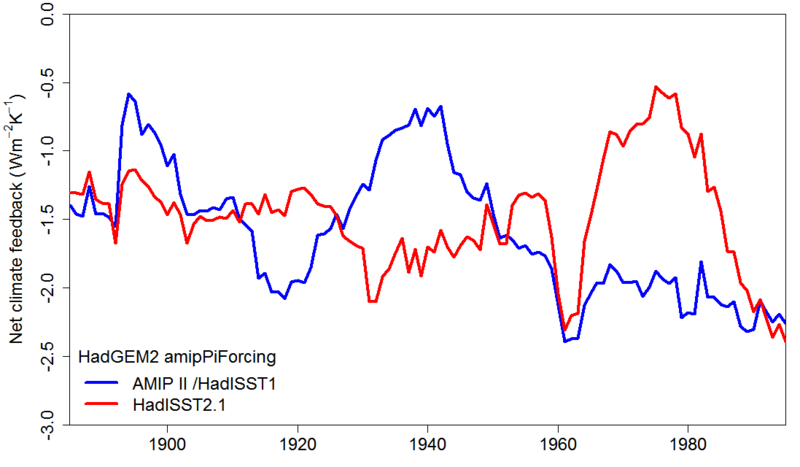 Feedback over 1871-2010 nearly halves upon switching SST and sea-ice dataset from AMIP II to the newer HadISST2.1. Table 2 gives full period results on the same basis as for Table 1, with results from that table shown for comparison. The mean EffCSamip for the two Hadley models is 71% higher when using the new rather than the old dataset to drive the amipPiForcing simulations – it is 13% higher than EffCShist, as opposed to 34% lower when using the old dataset. EffCSamip even exceeds the long-term sensitivity, EffCS4xCO2. Moreover, based on regression using pentadal rather than annual means, which is generally more reliable, for HadGEM2 (I do not have HadAM3 data) EffCSamip is 5.11°C, 13% higher still and 28% above its EffCShist. Table 2. Results from Hadley model amipPiForcing simulations driven by HadISST2.1 SST and sea-ice data. Means are for HadGEM2 and HadAM3 only. As in Table 1, for each model EffCSamip and EffCShist are both calculated using the appropriate common F2⤬CO2 estimate, derived from regressing over years 1-50 of their abrupt4xCO2 simulation. There is no hint of these remarkable results in the paper itself. The main text merely comments that “The sensitivity of the results to the AMIP II boundary condition dataset is explored with analogous experiments using the HadISST2.1 SST and sea-ice dataset”. But, as can be seen, results using the HadISST2.1 dataset are radically different from those based on the AMIP II dataset – the sole dataset used throughout the paper itself. Using AMIP II data, climate feedback was much stronger (more negative) in amipPiForcing simulations than in forced simulations where the models simulated their own SST and sea-ice patterns in response to long term CO2 forcing or (less markedly) to historical forcing. Using HadISST2.1 SST and sea-ice data, the opposite result was obtained. If the same mean 1.71 ratio of HadISST2.1 based EffCSamip to AMIP II based EffCSamip found in the Hadley models applied to all six models in Table 1, the mean EffCSamip would be 22% higher than EffCShist rather than 28% lower, and would also exceed the mean EffCS4xCO2 by 12%. In my opinion the ancillary HadISST2.1-based results contradict the strong claims made in the paper. While it could be that the HadISST2.1 dataset is actually less realistic than the older AMIP II dataset, the large difference in results using the two datasets shows that the EffCSamip estimates are highly sensitive to the SST and sea-ice dataset used. The bulk of the difference in λamip arising when the HadISST2.1dataset is substituted for the AMIP II dataset is caused by differences in their sea-ice data, primarily in the Southern Hemisphere. Andrewsetal18 quantify the sea-ice contribution in HadAM3, at 71%, and imply that it is 100% in HadGEM2. Appendix B examines the differences in the evolution of sea-ice in the two datasets. 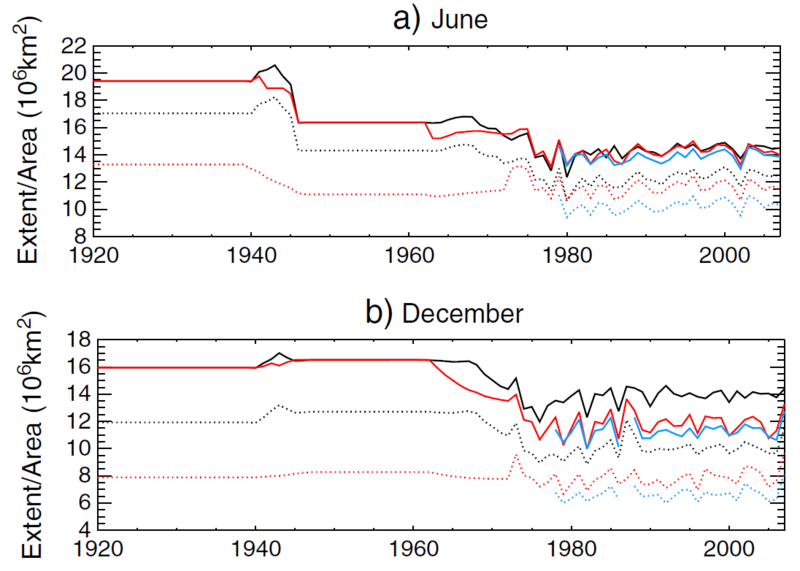 In their Supporting Information, Andrewsetal18 discuss analysing the HadISST2.1 based amipPiForcing simulation data over sub-periods that exclude the 1970s decade, over which the difference between their Antarctic sea-ice fraction largely arose. They find, unsurprisingly, that when they do so climate feedback in amipPiForcing simulations is much less affected by which SST and sea-ice dataset is used. But that is irrelevant. The fact is that their main results are completely non-robust to the use of a different, indeed newer, SST and sea-ice dataset. Since most of the difference in feedback arises from different changes in Antarctic sea-ice, it is unsurprising that the differences in feedback would be much smaller if the analysis was restricted to sub-periods over which the two datasets displayed similar changes in Antarctic sea-ice. The amipPiForcing results that Andrewsetal18 obtained using HadGEM2A, and results from the coupled HadGEM2-ES abrupt4⤬CO2 simulation, are illustrated in Figure 2. OLS regression of the annual, global mean top-of-atmosphere radiative imbalance anomaly on surface temperature over years 1-50 of the abrupt4⤬CO2 simulation (filled black circles; magenta line) provides a physically-reasonable estimate of F2⤬CO2 in this model, at 3.34 Wm−2. That estimate is the same as when regressing over years 2-10, recommended in Lewis and Curry (2018), and slightly below the 3.5 Wm−2 estimate derived from fixed-SST simulations. The x-intercept from regression over years 1-50 provides the EffCShist estimate of 4.01°C. Dividing |λamip| based on the old AMIP II dataset into that F2⤬CO2 estimate (blue line x-intercept) gives an EffCSamip estimate of 2.44°C, while λamip based on the new HadISST2.1 dataset gives an EffCSamip estimate of 4.51°C (solid green line), or 5.11°C if pentadal rather than annual mean amipPiForcing data is regressed (dotted green line). Regression over years 1-150 of the abrupt4⤬CO2 simulation (black and grey filled circles; orange line) gives a long-term climate sensitivity estimate, EffCS4xCO2, of 4.58°C. The corresponding F2⤬CO2 estimate, of ~2.95 Wm−2 is depressed by climate feedback in HadGEM2’s abrupt4xCO2 simulation weakening after the first few decades and is not physically-meaningful; it does not correspond to the effective radiative forcing from a doubling of CO2 concentration. The AMIP II dataset based EffCSamip value of 2.14°C that Andrewsetal18 calculate by dividing | λamip| into that F2⤬CO2 value (cyan line x-intercept) is accordingly artificially low. Figure 2. EffCS estimated from HadGEM2 simulations using OLS regression. Black-filled circles show means for years 1-50 of the HadGEM2-ES abrupt4⤬CO2 simulation, grey-filled circles those for years 51-150. Values derived from the abrupt4⤬CO2 simulation have, as is usual, been halved to give estimates of F2⤬CO2 (from the y-intercept) and EffCS (from the x-intercept). My second reason for disputing the strong, GCM-based, conclusions of Andrewsetal18 is that the differences between their estimates of λamip and λhist are too large to be accounted for by natural internal climate system variability as simulated by CMIP5 models. Lewis & Curry (2018) showed, for the HadGEM2 model amipPiForcing results given in Gregory and Andrews (2016) , that if internal climate variability simulated by CMIP5 models was realistic, such variability was exceedingly unlikely to account for more than a small part of the difference in feedback strength between the HadGEM2 amipPiForcing and abrupt4xCO2 simulations. The same is true for five of the six GCMs listed in Table 1. Only for GFDL-AM2.1 could internal variability simulated by CMIP5 AOGCMs account for the difference between the Table 1 λamip and λhist values in more than a tiny fraction of cases. GFDL-AM2.1 has the highest λhist / λamip ratio (0.90) of the six models. For the other five models, internal climate system variability can be ruled out as the cause of the difference between λamip and λhist in all but 0.2% of the almost 92,000 cases tested. It is possible that internal variability in CMIP5 AOGCMs may be unrealistic. However, if it is unrealistic, then is it reasonable to rely on the forced warming patterns that CMIP5 AOGCMs generate being correct? IMO, the strong claims made by Andrewsetal18 are unjustified. Their claims are dependent, inter alia, on the accuracy of the AMIP II observational SST and sea-ice dataset employed, the sea-ice data part of which comes from HadISST1. However, when the newer HadISSST2.1 version of the HadISST1 dataset is used in place of the AMIP II dataset in amipPiForcing simulations by the two Hadley models, the relationships in them between the effective climate sensitivity implied by the amipPiForcing simulations and CO2-forced EffCS – both that corresponding to the historical period and the long term measure – is reversed. It is not known which dataset is more realistic. Andrewsetal18 seek, unconvincingly, to discredit the HadISSST2.1 based full-period amipPiForcing simulation results, which I view as casting strong doubt on key claims in their paper. Justifying the exclusion of 1970s data on the basis that it does not well-fit their regression analysis, they restrict that analysis to two sub-periods over which the sea-ice trends in the HadISSST2.1 and HadISSST1 datasets are almost identical. However, over the full 1871-2010 period the HadISSST2.1 Antarctic sea-ice fraction trend is three times that in HadISSST1, whether or not 1970s data are excluded. The contrasting simulation results discussed in Andrewsetal18 and its Supporting Information show that whether climate feedback strength in amipPiForcing simulations is greater over the historical period than in long-term CO2-forced simulations depends on the SST and sea-ice dataset used; results using the more recent, improved, dataset suggest not. It follows that the Andrewsetal18 conclusion that accounting for changing temperature patterns increases historical estimates of climate sensitivity cannot be satisfactorily reached from their results. Moreover, the amipPiForcing results in the paper itself are inconsistent with internal climate system variability as simulated by CMIP5 models. In most cases the forcing data required to estimate ECShist from AOGCM historical simulations are unavailable, so their responses during appropriate periods of simulations involving CO2 concentration increasing at 1% per annum compound (1pctCO2) and/or abrupt4⤬CO2 simulations are used instead. Andrewsetal18 notes that the use of 1pctCO2 simulations as an analogue for historical climate change has important limitations in that it neglects the impact from non-CO2 forcings and unforced climate variability that could have had a significant impact on the pattern of historical temperature change. However, AOGCM warming patterns are typically similar in 1pctCO2 simulations, in the early decades of abrupt4xCO2 simulation cases and in historical simulations, and there is no evidence of systematic differences in AOGCM ECShist estimates derived from the three types of simulation. Since most AOGCMs have not been run to equilibrium at an increased CO2 level, recent papers have estimated AOGCM ECS values from their abrupt4xCO2 simulations (which are normally 150 years long) either by regression over years 21–150 (e.g., Armour 2017) or by fitting a two or three time constant exponential model to all years (e.g., Geoffroy et al. 2013; Proistosescu and Huybers 2017) , which produces similar ECS estimates. In most CMIP5 AOGCMs, doing so results in a higher estimated long-term climate sensitivity than (as in Andrewsetal18) regressing over years 1–150, on average by 6%, but the estimate may nevertheless be lower or higher than the model’s true ECS. The issue of the relationship of ECShist to ECS in AOGCMs has been investigated in several papers. Armour 2017 and Proistosescu and Huybers 2017 estimated mean ECS-to-ECShist ratios of respectively 1.26 and 1.34 for different ensembles of CMIP5 models. Lewis and Curry (2018) showed that both those papers had methodological biases, and that when these were corrected their median ECS-to-ECShist ratio estimates became closely consistent with those estimated by Lewis and Curry, which gave a median ratio of 1.095 for a larger ensemble of CMIP5 models (range 0.91 to 1.52). That estimate is almost identical to the estimate in Mauritsen and Pincus (2017), which used data from Geoffroy et al. 2013. For the measure of long-term CO2-forced climate sensitivity (ECS) used by Andrewsetal18, the median ECS-to-ECShist ratio in the same set of 31 CMIP5 AOGCMs is only 1.05. For the new MPI AOGCM, it is possible to closely compare feedback strength arising from historical period forcing and that in long-term doubled CO2 forced simulations in an ensemble of 100 historical period (1850-2005) simulations have been carried out using the MPI-ESM1.1 version, since the evolution of effective radiative forcing (ERF) during them was diagnosed, and a 1000 year simulation to near equilibrium under abruptly doubled CO2 concentration has been undertaken by the nearly identical MPI-ESM1.2 version. Feedback estimates from the MPI-ESM1.2 doubled CO2 simulation should apply also to MPI-ESM1.1; results from years 1-1000 of abrupt4xCO2 simulations by the two model versions are almost identical. From the mean changes in the Earth’s surface temperature and radiative imbalance (from preindustrial levels) in the final century of its doubled CO2 simulation, long term feedback in the MPI-ESM1.2 model is estimated to be in the range −1.32 to −1.35 Wm−2°C−1. These two values use alternative estimates of 3.9 and 4.0 Wm−2 for the level in this model of F2⤬CO2. For either value, the resulting estimate of long term ECS is 2.96 °C. The ensemble-median feedback in MPI-ESM1.1 over the historical period is estimated to lie in the same −1.32 to −1.35 range, depending on estimation method, with ECShist being very marginally lower or higher than 2.96°C according to which of the two F2⤬CO2 estimates is used. So, in this model, ECShist estimated from its historical simulations appears to be almost identical to its long term CO2 forced ECS. A direct comparison is also possible for the GISS-E2-R model between ECShist estimated from its historical simulations and long term CO2 forced ECS. With the latter derived from regression over years 21–150 of its 150-year abrupt4xCO2 simulation, the model’s ECShist is ~5% below its long term ECS. Much of any excess of ECS over EffCShist would take centuries to be realised in surface warming. Mauritsen and Pincus (2017) found that warming in 2100 due to the past increase in forcing would be barely affected if ECS exceeded EffCShist in the real world to the same extent as it does in CMIP5 models. So this issue, while of theoretical interest, has little practical relevance over centennial timescales. As Andrewsetal18 state, sea ice in the AMIP II dataset is essentially that in HadISST1. Figure 3, a reproduction of Andrewsetal18 Figures S1(c) and S1(d), shows the differences in HadISST1 and HadISST2.1 sea ice fraction in respectively the northern and southern hemispheres (NH and SH). The big difference is in Antarctic sea-ice, with much larger reductions compared to preindustrial in HadISST2.1. Both datasets are climatology prior to ~1940 (~1900 for Arctic sea ice), when no observational data is available. Figure 3. NH and SH high-latitude (poleward of 45°) sea-ice fraction in the AMIP II dataset (“amip-piForcing”), being that in HadISST1, and in the HadISST2.1 dataset (“HadISST-piForcing”). Andrewsetal18 point out that the relationship between temperature and sea ice/radiation is particularly unusual in the HadISST2.1-driven simulations during the 1970s, when sea-ice chart (1973) and passive microwave retrieval (1979) data becomes available. They state that when excluding this period the feedback between amipPiForcing simulations driven by the AMIP II dataset and those driven by the HadISST2.1 dataset becomes much more similar. Simply omitting 1970s data, even if justified, has a negligible effect on feedback in the HadISST2.1 driven HadGEM2 simulations. However, by excluding the 1970s decade, Andrewsetal18 actually mean regressing over the sub-periods 1871–1969 and 1980-2010. Regressing over those sub-periods separately is very different from excluding 1970s data when analysing changes over 1871-2010. Analysing the two periods separately results in the large HadISST2.1 change in Antarctic sea-ice during the 1970s being treated as not existing. Over the full 1871-2010 period, the linear trend in high-latitude SH sea-ice is 3⤬ as high in HadISST2.1 as in HadISST1: −1.5 as against −0.5 % century−1 (of the area poleward of 45°). Simply excluding the 1970s weakens the HadISST2.1 trend by only 4%, and it remains 3⤬ as strong as the equivalent HadISST1 trend. By contrast, over 1871-1969 the SH sea-ice fraction trends in the old and new dataset are identical, at −0.5 % century−1. They are also identical to each other over 1980–2010, at +1.1 % century−1. 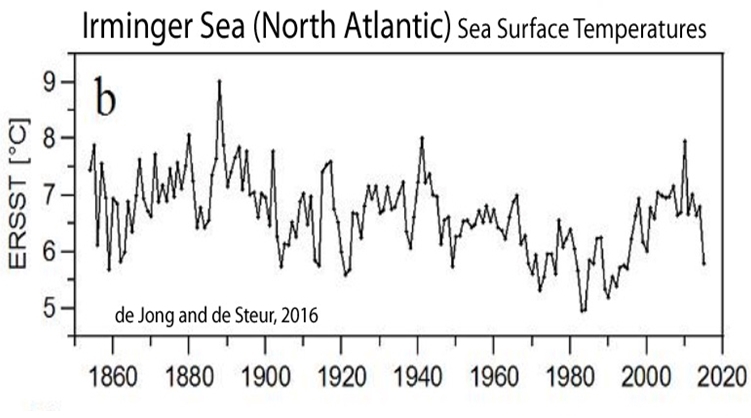 So Andrewsetal18’s method of analysis with 1970s data “excluded” in effect makes the HadISST2.1 Antarctic sea-ice record identical to the HadISST-derived AMIP II record, so far as linear trends (which is what Andrewsetal18 use) are concerned. In no way does such an analysis “check whether the amipPiForcing simulation results are robust to different historical SST and sea-ice datasets”, as Andrewsetal18 claim they do. The discussion in Andrewsetal18 also obscures the fact that HadISST2.1 is a newer, improved, version of HadISST1 that uses new data sources that had become available and applies bias corrections. Figure 4, a reproduction of Figure 14 in the paper explaining HadISST2.1 sea-ice concentrations, shows SH June and December sea-ice extent and area; fraction is proportional to area. Values prior to 1920, when there was no observational data, are the same as those in the 1920s. Prior to the early 1970s, sea-ice area is estimated from sea-ice extent (which is taken to be where its concentration is 15%). Over the entire period, sea-ice extent decreases more in HadISST1.1 than in HadISST2.1. However, the opposite is true for sea-ice area (and fraction). In HadISST1.1, the relationship of sea-ice area to sea-ice extent is very different before and after the 1970s. In HadISST2.1, which uses a more sophisticated method of deriving sea-ice area from sea-ice extent, their relationship is more consistent before and after the 1970s. That seems likely to be more realistic than the treatment in HadISST1.1, although given the very limited pre-1970s data available it is impossible to be sure which dataset more accurately represents the trend in Antarctic sea-ice area over 1871-2010. Andrewsetal18 say that the fall in HadISST2.1 sea-ice area/fraction in the 1970s produces an unusual relationship between temperature and sea-ice area. However, the available data prior to the mid/late 1970s consists of sea-ice extent climatologies covering 1929-39 and 1947-62. It is possible that the actual decline in sea-ice extent and area started well before the 1970s, maybe as early as during the 1950s. Although global temperature if anything declined slightly from the 1950s to the late 1970s, high-latitude SH (50°S–60°S) SST rose strongly over that period, since when it has changed little. If the SH sea-ice fraction decline started in the 1950s, the sea-ice fraction trend over 1871-2010 would be little affected, but the relationship between temperature and sea-ice area over the 1960s and 1970s would be much less unusual. In any event, whatever are the relative merits of the treatment of sea-ice in HadISST1 and HadISST2.1, the very different feedback strengths diagnosed from amipPiForcing simulations using the two datasets prove that the Andrewsetal18 main results are highly sensitive to the choice of SST and sea-ice dataset used, and therefore are too uncertain to draw any firm conclusions. Figure 4. Monthly mean Southern Hemisphere sea-ice extent (solid) and area (dotted), for HadISST2.1 (black) and HadISST1.1 (red). The blue lines are not relevant. Lewis and Curry (2018) Table S2, for 31 CMIP5 models, based on the methods of estimating the two types of climate sensitivity described in Appendix A, with ECS estimated by regression over years 21-150 of an abrupt4xCO2 simulation. It is unknown to what extent, if any, a similar pattern effect occurs in the real climate system. Effective climate sensitivity is a proxy for equilibrium climate sensitivity – the rise on global surface temperature caused by a doubling of preindustrial CO2 concentration after the ocean equilibrates – derived from transient changes. Both in AOGCMs and the real climate system, EffCS is often estimated from changes in mean surface temperature and the difference between forcing and planetary radiative imbalance. Lewis, N. and J. Curry, 2018: The Impact of Recent Forcing and Ocean Heat Uptake Data on Estimates of Climate Sensitivity. J. Climate, 31, 6051–6071, doi:10.1175/JCLI-D-17-0667.1. Available here. The paper refers to amipPiForcing simulations by eight AGCMs, but is only able to provide comparisons with their parent AOGCM’s response to CO2 forcing for six of them. Atmospheric Model Intercomparison Project (amip) simulations are a standard experimental protocol, in which an AGCM is driven by specified SST and sea-ice patterns. These patterns, and the atmospheric composition and other factors affecting radiative forcing, may be either fixed or evolving in time. Except for CAM4, which used constant year 2000 conditions. Land use is held constant in all cases. Feedback (λ) is measures how the planet’s radiative imbalance responds to a change in global mean surface temperature. The radiative imbalance is traditionally measured downward, so that a more highly negative λ (and so a greater absolute value of λ, | λ| or “feedback strength”) corresponds to a more strongly stabilizing climate system response. Lewis and Curry (2018) section 7c. Lewis and Curry (2018) section S4 / Table S2, and Armour (2017). Year 1 has been included in the regression here in order that the appropriate F2⤬CO2 values linking λamip and λhist values to effective climate sensitivities are very close. Generally, sensitivity estimates are almost the same whether regression is over years 1–50 or years 2–50 of abrupt4xCO2, or if derived from changes after 100 years in 1pctCO2 simulations (those in which CO2 concentration is increased at 1% per annum compound). Deriving λ by regression of the Earth’s annual global mean radiative imbalance on surface temperature. CAM4, CAM5.3, ECHAM6.3, GFDL-AM2.1, GFDL-AM3, GFDL-AM4.0, HadAM3 and HadGEM2. The GFDL simulations ran from 1870, with the AM2.1 and AM3 simulations ending in 2004; Andrewsetal18 discarded the year 1870 data. In AOGCMs, T and N are normally measured as anomalies relative to (i.e., changes from) their mean values in the same model’s preindustrial control simulation, sometimes adjusted for drift. To simplify comparisons, I have (as in Andrewsetal18) taken forcing for 4⤬ CO2 in CMIP5 models to be twice that for 2⤬ CO2. Computations in specialised models using slow but accurate radiation codes imply that in the real climate system it is about 2.09 times as high, but CMIP5 models use cruder, faster radiation codes and their 4⤬CO2 to 2⤬CO2 forcing ratio varies somewhat. ERF is the top-of-atmosphere (TOA) radiative forcing once stratospheric, tropospheric and other rapid climate system adjustments not related to surface temperature have taken place. It may be estimated using GCMs either from fixed-SST simulations or as the y-intercept of the regression line fit of N to T in a abrupt4xCO2 simulation. Such regression-based ERF estimates will however be biased downwards if the regression is affected by the decline in feedback strength that occurs in most AOGCMs a few decades into their abrupt4xCO2 simulations. It is standard to use ERF estimates, including for F2⤬CO2, when estimating EffCShist from observed warming. For the 31 CMIP5 GCMs considered in Lewis and Curry (2018), the mean F2⤬CO2 estimated from regression over years 1-50 of abrupt4xCO2 simulations is 3.80 Wm−2. That is the same as when estimated over years 2-10, a period starting after the rapid adjustments from instantaneous TOA radiative forcing to ERF have taken place and ending before feedback strength shows any noticeable decline. The mean F2⤬CO2 for the six AOGCMs featured in Table 1 estimated from regression over years 1-50 of their abrupt4xCO2 simulations is almost the same, at 3.74 Wm−2. The mean ERF F2⤬CO2 estimate of 3.80 Wm−2 referred to in the preceding endnote also agrees to a recent estimate of stratospherically-adjusted F2⤬CO2 using accurate radiation code (Etminan, M.et al, 2016. Radiative forcing of carbon dioxide, methane, and nitrous oxide: A significant revision of the methane radiative forcing. Geophys. Res. Lett. 43(24) doi:10.1002/2016GL071930). The IPCC AR5 report estimated ERF for CO2 to be the same as its stratospherically-adjusted radiative forcing. Titchner, H. A., and N. A. Rayner (2014), The Met Office Hadley Centre sea ice and sea surface temperature data set, version 2: 1. Sea ice concentrations, J. Geophys. Res. Atmos., 119, 2864–2889, doi:10.1002/2013JD020316. Andrewsetal18 term the original AMIP II, HadISST1 sea-ice based, simulations “amip-piForcing” and those based on the HadISST2 dataset “HadISST-piForcing”. However, both are atmosphere only simulations with preindustrial forcing, so we refer to both as amipPiForcing simulations. As it happens, that excess slightly exceeds both the mean and median ratio in CMIP5 AOGCMs of long-term CO2-forced effective sensitivity to ECShist. Estimating λamip and EffCSamip from the mean N and T anomalies (relative to the 1871-1900 mean) over the final 20 simulation years gives estimates substantially closer to those from regression (with intercept) using pentadal-mean data than using annual-mean data. Basing the models’ response to historical forcing on that in CO2-only forced simulations over a period providing a reasonable comparison to the evolution of forcing over the historical period. Andrewsetal18 say that in HadGEM2 the less negative feedback when changing dataset to HadISST2.1 is due to the positive shortwave (SW) clear-sky feedback nearly doubling. As in Andrewsetal18, anomalies for abrupt4⤬CO2 simulations are relative to values in the same coupled model’s preindustrial control, while those in the atmosphere-only amipPiForcing simulations are relative to the 1871-1900 mean in the same simulation. IPCC AR5 WG1 Table 9.5. Testing is based on detrended T and N values for all 18,391 140-year long segments from 43 archived CMIP5 model preindustrial control run simulations. For each model, ensemble mean N from its amipPiForcing simulations is compared with that derived from T in the same simulations and detrended values NIV and TIV from each piControl simulation segment in turn. For each thus generated realization of internal variability, ΔN is computed as λhist (ΔT − ΔTIV) + ΔNIV, changes Δ being mean anomalies for the final 15 years of the amipPiForcing experiment, as in Lewis and Curry (2018), with the anomalization period being the first 30 years. Using means over the final 20 rather than 15 years gives the same result. For the ECHAM6.3/MPI-ESM1.1 model, its estimated λamip value of –1.90 Wm−2 °C−1 can be compared with the actual λhist values in its ensemble of 100 historical simulations. Those λhist values, estimated from changes between the first and last 20 years of the historical simulations, ranged between 1.04 and 1.52 Wm−2 °C−1, with a median of 1.30 Wm−2 °C−1. Armour (2017) found that averaging responses over years 85-115 of 1pctCO2 simulation provided a good proxy for EffCShist. Lewis and Curry (2018) showed that for 31 CMIP5 models their ensemble-mean ECShist estimated from years 85–115 of 1pctCO2 simulations (during which the average age of forcing increments is fifty years) and from regression over years 2–50 of abrupt4xCO2 simulations differ by under 1%. Lewis and Curry (2018) showed that in the GISS-E2-R model ECShist estimated from historical simulations very marginally exceeded ECShist estimated from years 85–115 of 1pctCO2 simulations. For the other model for which I have been able to obtain historical simulation effective radiative forcing data (MPI-ESM1.1, which incorporates almost the same ECHAM6.3 atmospheric model as that used in Andrewsetal18), ECShist estimated from historical simulations (2.72°C per Dessler et al. 2018 DOI: 10.5194/acp-18-5147-2018; I estimate marginally under 3°C) is insignificantly different from ECShist estimated by regressing over years 2–50 of the almost identical MPI-ESM1.2 model’s abrupt2xCO2 simulation (2.62°C). Armour, K. C., 2017: Energy budget constraints on climate sensitivity in light of inconstant climate. feedbacks. Nature Climate Change, 7, 331-335. Geoffroy, O., Saint-Martin, D., Bellon, G., Voldoire, A., Olivié, D. J. L., & Tytéca, S. (2013). Transient climate response in a two-layer energy-balance model. Part II: Representation of the efficacy of deep-ocean heat uptake and validation for CMIP5 AOGCMs. Journal of Climate, 26(6), 1859-1876. Proistosescu, C; P Huybers ,2017. Slow climate mode reconciles historical and model-based estimates of climate sensitivity. Sci Adv 3: e1602821. For the 31 CMIP5 models investigated in Lewis and Curry (2018). The medians for the two measures are close to each other. For instance, in the GFDL models used in the paper, regression over years 21–150 of their abrupt4xCO2 simulations materially underestimates their true ECS; in the UKMO HadGEM2-ES model it appears to materially overestimate it, and in the MPI model it appears to estimate it fairly accurately. Even running a model forced by CO2 change to equilibrium does not necessarily give an accurate estimate of its true ECS, since model variables drift (due, e.g., to energy leakage) and such drift may be time and/or temperature dependent. The range does not include uncertainty in the estimates of EffCShist and ECS. In the real climate system the ECS-to- EffCShist ratio could in any event be outside its range in CMIP5 models. Mauritsen, T., and R. Pincus, 2017: Committed warming inferred from observations. Nature Climate Change, 7(9), nclimate3357. Based on the Lewis and Curry (2018) EffCShist estimates. While a corresponding simulation with doubled CO2 does not appear to have been carried out using the MPI-ESM1.1 version, a 2,600 year long abrupt4xCO2 simulation has been. Results using the first 1000 years’ data are almost identical to those from the 1000-year abrupt4xCO2 simulation using MPI-ESM1.2, while the long term sensitivity estimate increases by only ~2% between years 1000 and 2600. Estimating λ either from changes between means for the first and last ten years of the historical simulations or from annual regression over them, at −1.34 Wm−2K−1 in both cases. Data from the first two simulation years was discarded since the forcing estimates for those years appear to be anomalously low. ECShist is estimated from the ensemble-mean of historical simulation data at 2.16 K (Lewis and Curry 2018 sections 7c and S3) and its Deming-regression derived long term ECS as 2.27 K. No adjustment has been made for 4⤬ CO2 forcing being slightly more than double 2⤬ CO2 forcing, as that does not appear to be the case in GISS-E2-R.
 Tim Andrews has helpfully provided me with the HadGEM2 HadISST2.1-based amipPiForcing global T and N data. I have not as yet been able to obtain the corresponding data for HadAM3. The HadISST1 1871–2010 trend weakens by 1% when 1970s data is excluded. Pingback: Warming patterns are unlikely to explain low historical estimates of climate sensitivity | Watts Up With That? I’m sorry but I need a “plain English” translation of the “plain language” summary. I read the whole thing once and I need help. Nic Lewis has a couple of papers out in which he uses the temperature record to show that ECS is somewhere between 1.5 and 1.7 (the exact number is different between the papers). This is in disagreement with the ECS that models show (which if memory serves me are greater than 2). This is Nic’s reply to a paper which attempts to show why the models should be trusted over the temperature record. The argument that he makes that makes most sense to me (he makes several) is that the accuracy of the data that they are using to show that the calculation done by Nic’s method is flawed is less than the accuracy of the temperature record. “These studies employ observations but still require an element of modeling to infer ECS. There’s a whole literature pointing out the errors in the low-end energy-budget-model-based climate sensitivity estimates made by Lewis+Curry, among others. Lewis has responded to some of this literature. But he cannot, and you cannot, act as if his approach does not depend on a model. It clearly does depend on a model. Sanakan, But energy balance models are actually laws of physics that are the basis of modern physics. GCM’s are not based on the laws of physics because of their sub grid models similar to turbulence models. The real weakness of the energy balance method is the forcings. Those come however from the IPCC AR5. Atomsk’s, which model uses fewer unvalidated assumptions, energy budget model processing of observational record, or bottom-up reconstructions of the global hydrosphere, (GCMs)? In other words, which type of model can produce less variance from plausible tinkering with its assumptions? Your question does nothing to rebut the point I made; namely: people are wrong when they claim that the approach used my Lewis+Curry is based on just observations (or observations + basic laws of physics), not climate models. How you feel about GCM-based approaches relative to energy-budget-model-based approaches, does nothing to change that point. Personally, I think the paleoclimate data shows that both model-based approaches under-estimate equilibrium climate sensitivity, though the GCM-based approaches do so less egregiously than the sort of energy-budget-model-based approaches used by folks like Lewis+Curry. Moreover, the flaws in energy-budget-model-based approaches are well-documented in the literature, including in the sources I cited before. But, again, whether I’m right on that or not, is irrelevant to the aforementioned point I was making on energy-budget-model-based estimates not being based on just being based on observations or basic physics. And if all the models are not fit for predicting the distant future, then we simply have no firm idea if there is a problem or not. That is the actual situation – we simply do not know what the future holds. We do know, however, that more energy is needed to move the bulk of mankind out of poverty. That is where our resources should be directed, as opposed to analyzing the crap over the of number of angels that can fit on the head of a pin that may or may not prick us. Actually, we do know. Past climate cycles will repeat in the future. This warm period will play as did the Roman and Medieval warm periods and it will end into a little ice age like the Medieval Warm period ended. We do know that more energy is needed to move t.he rest of mankind out of poverty!!!!!!! YES! YES! YES! Fossil Fuel and Nuclear, YES! windmills and solar and ethanol. NO! NO! NO! except in unique cases where it might work. The IPCC climate models are controversial. The reason for that is almost every non-climate activist, scientist or lay person, sees the unorthodoxy of giving preference to the models that are the furthermost removed from observation. In a field that we all can agree is perilously fraught with bias stemming from the investigator’s and funder’s politics, it’s naturally suspicious that the answers derived most directly from observation is held in such suspicion. I salute Nic for continuing to unmask the shell-game. Atmosk’s, I know you want to change the subject to paleo, or anything else. I hope you will respect the topic of the post, however. There are tons of posts on paleo. Angels and pinheads I fear. Even ‘observations’ rely on models (aka abstractions). Better to spend ones time debating which are the most appropriate models to use under the circumstances. You wouldn’t typically use the theory relativity to help you build a garage – good old Newton would suffice (although I one sat an exam where I was asked how fast I’d need to going to get a 30′ pole into a 20′ garage). This debate is very much analogous. GCMs it can be argued try and explain a lot of unnecessary stuff that just gets in the way of estimating climate sensitivity. It has struck me that there is a philosophical issue here about whether there is some idealised notion of climate sensitivity that can only be deduced by considering all possible worlds that only the GCMs can reveal, or if it has to be constrained by the actual world we have experienced so far, where GCMs actually get in the way because they can’t easily be constrained to the historic record, and simpler models are to be preferred. I tend to the latter, particularly if we’re worrying about the next century. Unfortunately there is an industry out there doing well out of the complexity, as Atomsk… has ably cited. But he’s right that we all use models, we can’t get away from them. No, I wouldn’t agree to that. He’s a practitioner of it; Forster would be more of an expert on it. That’s why Forster is invited to write scientific reviews on the subject, including the one I cited before. Excuse me while I laugh at that baseless claim of your’s. Geez Sanakan, Can you please respond to Ron’s points? Your scattered citations for example on clouds are just qualitative. Science is about quantification. You would help yourself if you realized this. Here’s some advice: don’t make stuff up in a failed attempt to prop up some conspiracist ideas you have about a so-called “well-funded climate establishment”. He said nothing of substance, though I did respond to some of the baseless, conspiracist points he made. And please don’t tell me what science is about, especially when you clearly haven’t read the papers you’re commenting on. For example, the paper I cited on clouds contains quantification, as you would know if you had bothered to read the paper. Also, science routinely uses qualitative metrics, as you would if you knew about branches of science that use imaging, such as discussions of crater structure, tumor morphology, etc. You quote a paper that averages across all GCMs within an ensemble by way of a rebuttal to a statement about which models from within the ensemble should be preferred. Ironically you demonstrate exactly that the claim isn’t baseless. It is incorrectly assumed that there is no large intrinsic variability – in cloud topically. These guys don’t do complicated – it is all as simple and as certain as science gets. And as I say – models are machines for generating uncertainty. The thick black line is mine – as likely as any other trajectory – more likely than most. So which solution should be sent to the CMIP? The answer to that is a posteriori solution behavior (James McWilliams 2007). That’s right – like Atomski – they pull it out of their arses. Nowhere did the paper I mentioned give “preference to the models that are the furthermost removed from observation”. No need to pretend otherwise. Atomsk’s Sanakan’s rantings are long winded, overly agressive, rude, and patently offensive. Therefore, I just ignore his posts. As a scientist I prefer a more civilized dialog. Anyway, his agressive stance must be trying to over compensate for something other than AGW. I will always ignore him (Atomsk’s Sanakan, don’t bother to reply, you WILL be ignored.). “The tone argument (also tone policing) is a logical fallacy that occurs when an argument is dismissed or accepted on its presentation: typically perceived crassness, hysteria or anger. Tone arguments are generally used by tone trolls (esp. concern trolls) as a method of positioning oneself as a Very Serious Person. It’s ironic that you say this, after you had to change the quote in order to match what you pretended it said. Amazing. Allan: Atomsk’s Sanakan’s rantings are long winded, overly agressive, rude, and patently offensive. I think that they are worth reading in full. That they are obnoxious I regard as less important. I think he would be more effective if he were unfailingly polite, but I am not certain. I looked at Prof. Piers Forster’s cv to evaluate your claim and found it lacking. I would say Forster’s specialty is diagnosing forcing and ECS in GCMs. His interest in EBMs and effective ECS (what Nic does,) is limited in rationalizing and reconciling it with climate industry vaunted GCMs. This can be seen in Forster (2016) abstract. Clearly, Forster believes the truth lies in the GCMs, and that observation needs to be brought into line. So he attacks EBMs by pointing to the largest unknown: radiative imbalance. In Marotzke and Forster (2015) he lends his 2013 GCM diagnosed forcings to a paper that attempts to save GCMs from being invalidated by their failure to include “the warming haitus” in their 5-95% probability window. After Nic pointed out the paper’s circularity Forster, along with Marotzke denied the flaw. Their paper, published in the once prestigious journal Nature, used CMIP5 GCM forcings to evaluate GCM temperature output variance to observed temperatures, the same observed temperatures (pointed out by Nic) used in 2013 by Forster to diagnose the GCM forcings. Forster responded: “Nic is right that ΔT does appear on both sides [of the equation], we are not arguing about this we are arguing about the implications.” He went on to make an abstruse argument that evaded the primary fact: they used model created value as a constraint to the conjugate value in the same model. It would be like feeding travel times into a model and then later reverse the model’s function to gain travel times to claim validation. The paper is now forgotten mainly because the warming hiatus was killed by adjusting the observed record so that the models were saved without need of MF15. But we should remember what nonsense levels will be undertaken to protect GCM-centric climate science. I laughed at the comment and ditto before looking at the post. Not that I have gone much further. I don’t know what I resent more. Atomski’s ‘I’m getting fed up with this myth’ – well whoopin’ f#@kin’ doo – or the very notion of a linear sensitivity. The 1-D climate model uses physically based equations to determine changes in the climate system as a result of changes in solar intensity, ice reflectance and greenhouse gases. With a small decrease in radiation from the Sun – or an increase in ice cover – the system becomes unstable with runaway ice feedbacks. 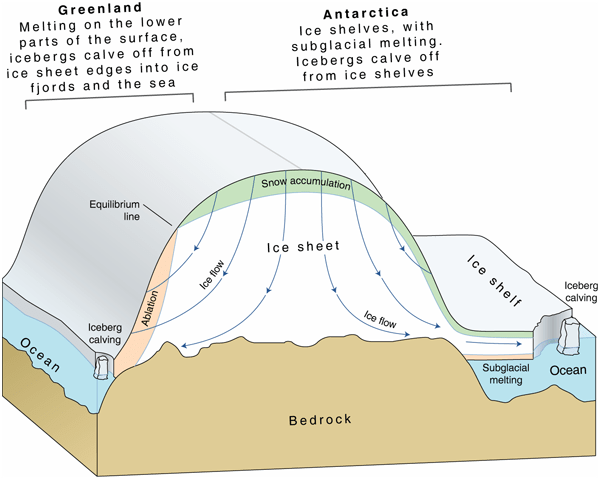 Runaway ice feedbacks drive the transitions between glacial and interglacial states seen repeatedly over the past 2.58 million years. There are warm interludes – such as the present time – of relatively short duration and longer duration cold states. The transition between climate states is characterised by a series of step changes between the limits. 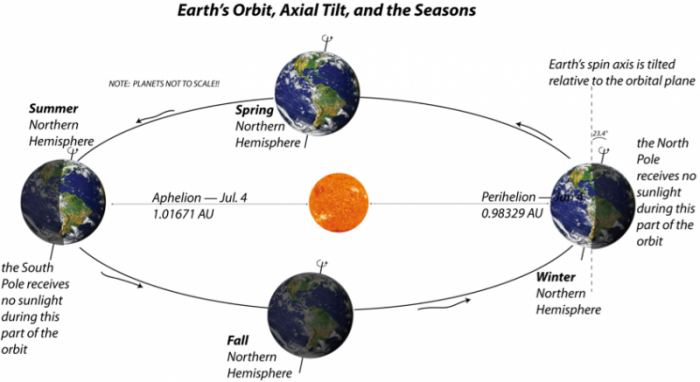 It caused a bit of consternation in the 1970’s when it was realized that a very small decrease in solar intensity – or an increase in albedo – is sufficient to cause a rapid transition to an icy planet in this model. nonlinear math. GCM are machines for generating uncertainty. One of the reasons for using different types of models. That is not by the way an IPCC opportunistic ensemble. But as both EBM and GCM use IPCC forcings – are either even remotely reliable. CERES net radiant flux data shows a warming planet this century – warming in shortwave and cooling in IR. A pattern caused by cloud cover changes associated with sea surface temperature in the Pacific especially. Large natural variation – even abrupt change – is seen in data – but are not found in basic physical theory used to estimate forcings. 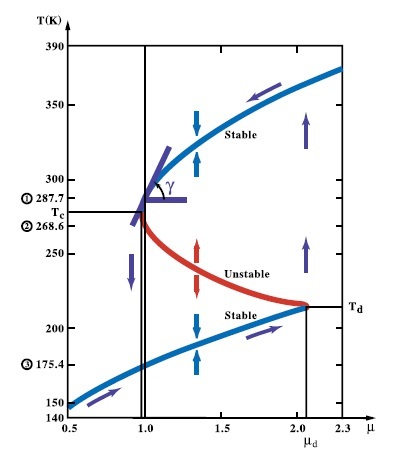 Robert That same hysteresis picture was shown by Dutch glaciologist Hans Oerlemans in 2006 to explain why we are now in an interglacial stable state and glaciations and deglaciations are meta-stable states. One should ask the question, why did Greenland and Antarctica survive this interglacial, and Scandinavian and north american ice not? this limits the height of the icecap which renders it stability.. I can’t be bothered searching for obscure references – if you want to make a point include a damn link. But this is not a hysteresis loop. Call it what you will, but when oceans are warm and ice shelves and sea ice are minimum, it snow too much and builds ice volume which becomes enough to increase ice extent and cause cold enough to increase land and sea ice extent. When oceans are cold and ice shelves and sea ice are max, it snows too little and it snows way too little on land and ice flows and depletes until ice extent on land and ocean retreats. This may not be hysteresis, I don’t call it that, but it does work in a similar, but reverse manner, Hysteresis pushes back with less force in the other direction, ice cycles push back harder in the other direction. Ice volume builds in warmer times and it gets cold faster, ice volume depletes in colder times and it gets warm faster. Ice core data does support this. OK Robert, direct question, why did the Greenland icecap survive the Holocene? The climate dynamics logic is fatally flawed. AMO and Arctic warming is normal during solar minima due to increased negative NAO/AO. Rising CO2 forcing should increase positive NAO/AO, and help to reduce the extent of AMO and Arctic warming during a solar minimum. therefore are too uncertain to draw any firm conclusions. That sums it up very well, that sums up all of the CO2 sensitivity junk science. Nic, Please rephrase the plain language summary, it is not clear what is your summary of the paper and what is your critique on it. IMHO the message is very clear: In the Andrews et al (2018, see https://agupubs.onlinelibrary.wiley.com/doi/10.1029/2018GL078887) the authors claim that the sensivity is “pattern” depended. Nic shows that this is not the case. He deduces that the results of the paper are very sensitive to the used SST ( and Sea Ice) records. If one uses a newer product (HasSST2.1) with a much more realistic reflection of the antarctic sea ice one gets very much different results then in the main text of the paper. The “patterns” are nothing else then products of the uncertainty of the SST and Sea Ice observations mostly in the early years. IMO this should have been the work of the peers. The first three points of the plain language summary are my attempt to summarize what the paper does, what results it obtains and what claims it makes. The remaining points summarize my reflections on / critique of the paper. The debate on ECS is not only interesting from a scientific point of view. It tries to answer an important question. How much would the surface temperature change if atmospheric CO₂ were to double? From a scientific point of view the debate might not make too much sense if there is no unique ECS and the response of the climate system to a doubling of CO₂ is very dependent on conditions (glacial vs interglacial, for example) and/or on the starting concentration. However having an approximation to the ECS and TCR values at present would be extremely valuable for policy decision. It would answer the question if we are in a Faustian bargain or if we are better off burning fossil fuels. The importance of the question can be deduced from the effort climate scientists dedicate to it. Without a sufficiently high ECS the whole climate alarm, with its millions of dollars would be unjustified, and climate scientists would lose their fame and a great part of their jobs and funding, besides being exposed as being wrong before the entire world. Without understanding the details and arguments, contemplating Nick Lewis efforts is like watching a scientific David vs Goliath fight. Neither side will have sufficient evidence to settle the question until more time has passed from the great increase in emissions in the latter part of the 20th century. However for the climate establishment it is enough to convince a good part of the most influential scientists, many of which are pre-convinced. I saw the “adjusting observations to models” meme two years ago or so as the teaser (headline) of a Science paper. (may of cause me much older, just what I witnessed). Sea surface levels seems to be already heavily model adjusted as a recently learned on this blog. Seems to become a new industry. Maybe the next scientific frontier in temperature adjustments? Many thanks to people like Nic Lewis who try to keep science honest. All model results are “highly sensitive to initial conditions” — “40 Earths”. So it is no surprise that starting with a different data set for SST and Sea Ice leads to different results for Andrews et al. I have my doubts about our ability to tease out the tiny ECS of CO2 forcing from the chaotic numeric results of climate models, no matter how carefully restrained. It may be a detail too minor to ever surface on its own. Why do climate scientists continue to be paid to play computer games on very expensive computers instead of doing something constructive? 4. Spectral analysis of temperature and annual rate of change of CO2 concentration produce practically identical amplitude spectra which have at least some maxima which correspond to the periodicities of the Moon and the planets. The only obvious CO2 climate sensitivity is the local changes to climate resulting from the greening of the Earth with increased CO2 concentration. Because models are fun. I have been a hydrodynamic modeler for decades. I can’t get beyond the smoke and mirrors scam of century long opportunistic ensembles – but something could be done with initialized decadal forecasts. Same idea as weather forecasts. It would have different grid sizes for different regions and so downscale for finer resolution over specific target zones. It needs thousands of times more computing power and a heat sink the size of Texas – that would cost many billions of dollars. I say go for it. But what did change temperature in the 21st century? Lucky we have CERES for that. For net flux – an upward slope is a warming planet. It consists of SW and IR components and these are available at the CERES data products page. With low marine strato- cumulus cloud decrease there is a reduction of reflected light and an increase in IR emissions. It is an anti-phase relationship with SW changes dominant. It is caused by cloud changes associated with Pacific Ocean states – annual to multi-decadal at least. There may be larger fluctuations in cloud and other things happening that sometimes herald one of Didier Sornette’s outsized dragon-kings. “We emphasize the importance of understanding dragon-kings as being often associated with a neighborhood of what can be called equivalently a phase transition, a bifurcation, a catastrophe (in the sense of Rene Thom), or a tipping point. ” The Pacific is due for another shift any time if not now. A little cooler Pacific sea surfaces in the early 21st century record – a little warmer since – with closed and open cell could in low marine boundary layer (MBL) strato-cumulus respectively. Marine strato-cumulus being the primary reflectors of the planet sans a glacial. The geophysics is Rayleigh–Bénard convection in a fluid – the atmosphere – heated from below by the oceans. And here’s a little sketch of the nonlinear cloud and rain equation. This is the rain and cloud equation. Robert, models may be fun, after all, people everywhere now stand or sit staring at their ‘phone, laptop, tablet, etc and seem impervious to the real world around them. What are they achieving? and	South Pole: +0.00023 degrees C per annum, standard error 0.00250. The South Pole result is not statistically different to zero rate of warming. That is, there has been a gradual increase in the rate of warming from zero at the South Pole to a maximum at the North Pole. Trying discovering that from a model. It will not show unless the result is already built into the initial assumptions of the model. Where to from here? From a couple of modelling Illuminati. So there is unacknowledged epistemic uncertainty – and bad faith in opportunistic ensembles. And for a hydrologist and engineer – with a masters in env. sci. – they are just a tool. Era-interim 2m SAT by Copernicus. Total forcing from Haustein et al 2017, extended a few months by persistent change. TOA imbalance from CERES EBAF v4. Start period, the first 60 month average. Final period, the last 60 month average. ECS is not applicable with the standard calculation, because delta Q is slightly larger than delta F (It would become -19,5). Some people might argue that the above period isn’t very well ENSO balanced. However the Nino 3.4 trend (ERSST v5) for the period is actually lower than that of the CMIP5 average, and similar to the global or tropical ERSST trend. I’ve not a clue what Olaf is on. So you are not familiar with the observationally based estimates of TCR and ECS, that Nic Lewis and others are doing..
NIc uses the difference in temperature, forcing and system heat uptake between 1860 and the recent decade, which includes some qualified guesswork and large uncertainties. The system heat uptake way back has to be modelled. I use the Ceres Ebaf era when we have good data. I have simply calculated TCR and ECS as the difference between the periods March 2000 – February 2005 and April 2013 – March 2018 (the difference between the means of the first and last 60 months). I am not remotely interested in Ken Rice. Not much more in Nic Lewis. And you misunderstand that methodology. Your explanations are incoherent nonsense. While Argo and CERES EBAF – both acronyms btw – show warming in the 21st century. Most of it is cloud change – much of that in the Pacific. It undermines assumptions on which this nonsense is built. But to be honest I find myself completely at odds with the very notion of a linear TCR and ECS. And if you have a clue about that – you will not get it from Nic or Ken – I will be astonished. Well, you comment on blog post on climate sensitivity, written by a guy that focuses on observationally estimated climate sensitivity. You know little about it, are remotely interested, and don’t want to learn. Isn’t that a rather poor attitude? Where on earth have I suggested that you should learn about “Ken Rice”?? A weird insinuation..
CERES EBAF is indeed an acronym, so it looks like you have missed both spelling and capitals in the right y-axis label of your chart. I don’t think anything like “power flux” exists. Do you mean energy flux? And the unit of “cumulative power flux” is probably not W/m2, but rather Joule (J) like in accumulated energy. Anyway, for the first time in history, CERES EBAF makes it possible to directly follow changes of the energy imbalance at TOA (The system heat uptake, or Q in energy budget terms). Whether you like it or not, the imbalance is increasing by 0.36 W/m2/decade (linear regression) during the CERES EBAF era. That change is larger than the increase in total forcing F (anthropogenic + natural), which is 0. 29 W/m2/decade. Which means that F – Q is negative.. The increasing TOA imbalance seems to be caused mainly by a decreasing albedo (reducing the outgoing shortwave radiation). This can be caused by a reduction in cloud, sea ice, or snow cover.. An albedo feedback? The only thing Olaf gets right is that there is a typo on the right hand axis. Ken Rice is ATTP. And something about commenting on a blog where I dismiss both computer and observational methods and insist that sensitivity is dynamic. A Watt is a unit of power – power flux is given in W/m2. And the imbalance calculated is simply the difference between average power in and power out – added month by month and compared with Argo heat. Very different parameters with a very high correlation as there must be if both data sources – ocean and space – are accurate. One can multiply by the number of seconds in any month to calculate energy in and energy out – but that is integrated in Argo heat – largely. Nominal anthropogenic forcing increases by 0.3 W/m2/decade – this is not the imbalance at TOA – and this can’t be easily seen in the TOA flux record – which is presumably some combination of anthropogenic and large natural variability – and that co-varies with ocean heat. The actual imbalance was some 0.8 W/m2 – obtained here by averaging power imbalances and is consistent with ocean heat change. Assuming that this is entirely anthropogenic – one way or another – is a wrong assumption. An interesting outcome is that the power flux (radiative) imbalance declined over the period of record. This is the first time I know of that this has been derived directly from CERES data. It has exclusively been derived from ocean heat. What can be seen in CERES data is a decrease in reflected SW and an increase in IR emission. 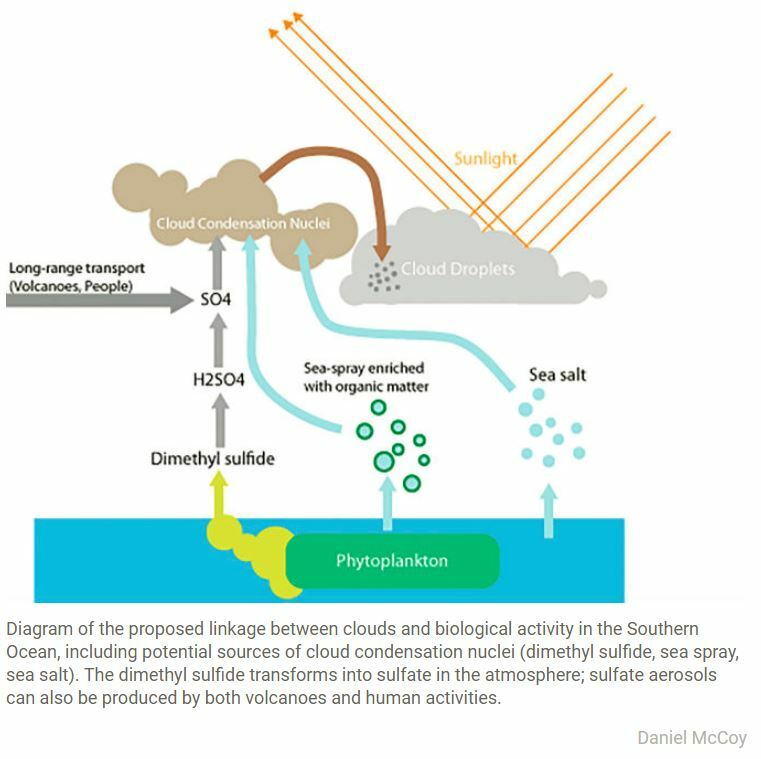 This is low level cloud by the nature of cloud radiative geophysics but to assume that cloud change is entirely a feedback to anthropogenic atmospheric warming is just an incorrect assumption. Much if not most of it emerged from changes in ocean and atmosphere circulation. Olaf is all over the place in the usual ideologically committed and woefully uninformed way – I can handle just so much motivated and fuzzy thinking before pulling the pin on another bad faith discourse. RIE seems to recognize that CO2 forcing alone is 2 W/m2 and that the imbalance is 0.8 W/m2, but seems to dismiss the CO2 forcing as the major cause of the imbalance. That is, there must be something else as yet unknown causing the warming, and the 2 W/m2 CO2 effect must also be canceled by something as yet unknown. Two unknowns don’t make a right. Is that what I said? Jiminy is at it again with his quite pointless misrepresentations – and frequently worse. I wonder how he explains fellow traveler Olaf’s ignorance? Jiminy is a fervent believer that climate is explained by the IPCC table of anthropogenic forcing.- and that therefore nothing else can be real. Anything beyond his simple memes – repeated endlessly – is invisible to him. Jiminy is a compelling case study. The answer he cannot even contemplate is there in the CERES cloud product. A period of declining cloud cover in a period of little to no surface temperature increase – apart from the recent El Nino – and that can be seen in the cloud record along with a more recent increase again. Little to no surface warming suggests that very uncertain computer derived cloud feedbacks are moot at any rate. Much of the future decadal evolution of climate depends on what happens in the Pacific. The next Pacific climate shift is overwhelmingly likely to happen in the next decade if it is not happening now. Now that will be fun. At the centennial scale enhanced NH meridional blocking patterns – and AMOC changes – with a declining sun come into play. I do not and never have denied that anthropogenic warming is there – it is just impossible to see in the satellite record against a background of large annual to millennial variability in the Earth system. It is Jiminy and Olaf who are the geophysics deniers. Olaf is right about one other thing – CERES is providing clues but these are not the droids they are looking for. I thought I had fixed this? I am only asking you to compare two numbers 2 > 0.8. This is about the energy budget terms. You keep coming back with garbled mixtures of all the things you can think of at this moment. And that is about Jiminy’s level of sophistication. The anthropogenic imbalance depends on ocean thermal inertia. Given the huge annual warming and cooling of the oceans driven by orbital eccentricity – I think we can discount decades of thermal inertia. Which is what it takes to accumulate an anthropogenic imbalance of 0.8 W/m2. The annual increase in greenhouse gas forcing is 0.03 W/m2 – which is the relevant number. Ocean heat tracks TOA flux closely as it must. And of course there is no internal variability is there Jiminy? I’m not the one who freely invents nonsense – and then adamantly refuses to back down when caught out. And for Olaf’s benefit the difference between TRR and ECS depends on ocean thermal inertia as well. TCR of course – but I had better correct it or someone will crow about how I know SFA. So you keep saying Jiminy – to the extent of copying and pasting a comment just above – and I am bored with it. This is mainstream science that appears to be invisible to you. Unless those clouds are 2 W/m2 different now from pre-industrial times, they are irrelevant. Besides CO2 is already strong enough to account for all the surface warming and increased heat content, so it is odd that you keep looking for other mechanisms as though you have already dismissed the CO2. CO2 is not needed for late 20th cerntury warming – or for the 21st. But as I said I’m sure it must be there. Yes, and the full magnitude of the PDO is about a tenth of a degree and it spends half its time in a cooling phase. This is noise compared to what CO2 is doing. It’s all about relative magnitudes, and CO2 is the one with the largest and persistent warming effect making it a match to the observed warming trend of the last century. It seems reasonable to suspect that the Pacific state added to warming in the 20th century – based on late 20th century data. We’re a lot warmer than any of the last 1000 years now, so clearly there is a factor you’re missing in the last century or two. The geophysics of intrinsic exists – but of course it is invisible to Jiminy. He will next say it is warming feedback – just like Olaf. Everything is CO2. It just ain’t. It’s not just CO2. There is forcing from other GHGs like methane and ozone, there’s aerosols, and there’s solar and volcanic forcing too. CO2 is by far the largest individual one accounting for 80-100% of the net. The largest intrinsic variability is ENSO that does not show up as a forcing at all. Jimmy has a simple story repeated far too often – and his denial of Earth system dynamics – something that goes far beyond ENSO as powerful as that is – is the depth of agnotology. It’s the quantitative energy flows in the system that show the driving force behind the warming response and rising heat content. It is only space based platforms that reveal quantitative energy dynamics – and that tells a more complex story than Jiminy’s. You’re just ignoring the trend in ocean heat content which shows an imbalance of 0.5-1.0 W/m2 for many decades now. This is energy provided by net forcing because the ocean can’t heat itself. You need to look at energy balance models. They only have three terms, forcing, response and imbalance, and are based on energy conservation. Typical results have the forcing at 3 units being the sum of the response (2 units) and imbalance (1 unit) whether you look at net energy change (in Gigajoules) or energy flows (in W/m2). It just goes around in circles with simple memes. I have clearly not ignored ocean heat. The source here is low frequency climate variability. Space is where all the energy comes from and goes to. The net ends up in oceans mostly. There is no contradiction as Jiminy seems to be suggesting. The source of Wong et al’s ocean heat was low frequency climate variability. You look at the energy terms individually and their annual variability ad nauseam but never the three terms together averaged over multi-decadal time scales from which you learn how they fit together in the big picture needed for climate change. There is questionable satellite data before CERES – and atrocious ocean data before Argo. The sun changes a little – IR and SW quite a lot more for many reasons. Including substantially with ocean and atmospheric circulation changes over millennia. Causing an incident annual solar insolation variation of some 20W/m2. Can heat in the pipeline survive this? Jiminy has a number – 2 – that he repeats endlessly with diverse verbiage he invents on the spot or learns by rote in echo chambers, the inevitable disparagement of outsiders and commonly acts in bad faith in the service of progressive tribal memes. That is Jiminy’s big picture. So you don’t believe energy budgets because…eccentricity. Wonderful stuff. I use numbers about forcing, heat content and warming that the IPCC uses, and you often quote the IPCC verbatim without complaint. The self-contradiction seems to be on your side because you throw up non-specific complaints about the numbers. Jiminy gets the IPCC numbers wrong – believes that they have the authority of scripture – misapplies basic principles of geophysics – makes things up on the spot – is very selective and can’t think beyond his limited meme set. There is a reason I stopped reading IPCC reports in 2007. The summary for policy makers – Jiminy’s climate bible – is misguided. I don’t do blogs (plural) either. Generally a pointless waste of time. Just like discussions with Jiminy. I follow my nose in the primary literature and have for decades as an engineer, hydrologist and environmental scientist. You will note by contrast that Jiminy has no primary sources of any kind and will not reveal whatever technical or scientific background he doesn’t have. This is a pattern for these AGW pissant progressives. No knowledge beyond tribal memes and the delusion that they thus have the intellectual ammunition to hector even distinguished scientists should these depart an iota from the script. It is a politically and ideologically motivated madness very far from the ideals of curiosity driven science. The origin is the authoritarian impulse that has always motivated these types. It is the old cultural struggle between the coercive state – a good thing if their tribe can seize power – and free markets, liberty and democracy. They are noisy and have undue influence in some parts of academia, media, entertainment, education, etc. Not people I regard as having intellectual gravitas. More non-specific slurs there. At least you are specific about who you’re slurring, if not why. You may or may not know that forcing = response + imbalance, but you have no idea of nor interest in the relative sizes of these terms in the long-term and ongoing climate change. Instead you wander off into your own rabbit holes (orbital eccentricity and other general rantings on display here). We have been though this a million times. ΔTs – λΔF – a formula in which the anthropogenic component of Ts is unknown and the feedbacks derived from CMIP runs and even then there are immense uncertain. That is the essential problem with both approaches in this post. Nor is it known just how long it takes to get to an equilibrium – and therefore the size of the anthropogenic imbalance – especially given that there is so much else happening in global energy dynamics. But it is about as useful as Jiminy gets. The first differential global energy equation it turns out is far more precisely defined. It giver the right Jiminy answer – but the devil is in the details. 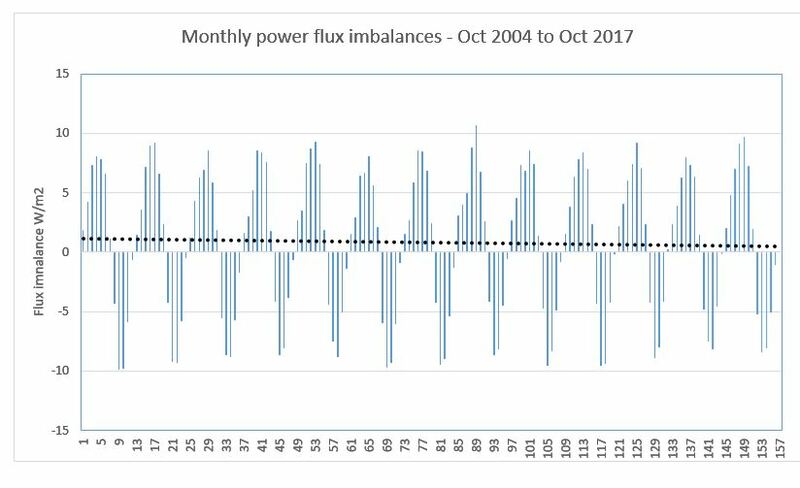 Power flux imbalances change from negative to positive on an annual basis. The average is 0.8W/m2 – consistent with rates of ocean warming. The trend over the period of record is negative. Such large swings in imbalances are not of course due to greenhouse gases. And this provides a quandary for mooted anthropogenic imbalances and thus heat in the pipeline that Jiminy can answer only with more of his habitual attempts at ridicule. Among the details is a declining energy imbalance over the period of record. Others include large natural variations in TOA flux – and I won’t quote Norman Loed et al 2012 yet again. Jiminy doesn’t read any of the links I post anyway – so is there a point? None that I can see. I make a metaanalysis of the AGW pissant progressive cohort. Their tools are ridicule, disparagement, misrepresentation, lies, bad faith, obfuscation,… – in the service of a collectivist ideology – or groupthink – that is based on the perceptions of the profound ignorance of societies in general and their own intellectual and moral superiority. Incredible but true. Jiminy dismisses it as a rant – but he knows full well that it is a culture war. The energy imbalance is positive and has remained so on decadal scales. This means that the response still lags the forcing, and there is warming in the pipeline even if emissions went to zero tomorrow. It puts the attribution >100% to a forcing dominated 80-100% by CO2 with most of the rest being other anthropogenic factors (GHGs, aerosols). Despite all the natural variability, CO2 and warming correlate at 93% over the last 60 years even as they both accelerated significantly in the second half. That the warming supports AGW so well in the observations with an effective sensitivity of 2.3 C per doubling is a fact and you don’t even need models to show it. You have dismissed CO2 as the major factor, and this is not rationalized except through your own insistence that you don’t know exactly what is happening as long as it is not manmade. RIE is a nitpicker, making silly complaints about me not spelling CERES with capitals. He lacks the self-awareness to understand the irony when I return the nitpicking in his face. Nitpickers focus on insignificant details and don’t get the bigger picture right. I just see a lot of unfounded claims in the discussion above, no evidence, no sensible reasoning..
RIE, please don’t write “power flux”. Flux is something flowing per time unit through an area, in this case radiation (energy) per second per square meter. The unit of energy flux is J/s/m2 or W/m2, which also can be called power per square meter. The unit “power flux” (power per time unit per area) would be W/s/m2 or J/s2/m2. What the heck is that? Energy flux acceleration/change?. Increasing radiative imbalance means that the rate of heat accumulation in the earth system is increasing. The ocean layer measured by Argo, 0-2000 m is not the only reservoir of heat. We also have the ocean below 2000 m (less known, but it will be better with deep Argo), ice caps, glaciers, sea ice, snow, lakes, ground frost, the ground/crust itself, and the atmosphere. The Argo layer represents about 82% (my best estimate) of the long term heat storage, but in the short term this can easily be offset by fluctuations in the other minor heat reservoirs. Thus, in the short term, TOA imbalance and Argo recorded heat change, don’t necessarily follow each other. The Argo array was not fully deployed until late 2007 (especially the southernmost oceans were not completely covered before then). After 2007 Argo and CERES data agree much better. “”He is dry but detailed. Definitely hard to read. Most of his posts at Judith’s have low response replies because he is so detailed and above the pay grade of normal commentators. He does dissect issues and discusses them in detail. I would love Nic to do a Nic Lewis lite explanation for with easy to follow steps. Unfortunitely, I agree with the unreadibility of Nick’s writings. I got a little farther than a few paragraphs, but I couldn’t complete it. It doesn’t matter how smart you are, what your education level is, how correct you are, or how many or how big the words you use are. Clearly, details and support of your argument matters. But what matters most is whether you can communicate well enough to keep the reader interested, keep the reader reading, and convey the message you want to deliver with the impact you seek. Nick missed these key points in writing the thesis above. Sorry to be so frank, but I too struggle with these factors whenever I write technical documents. Not all of us are blessed with the writing gift, and I know that I’m not so blessed. That’s why I revise my writings multiple times and have others edit and comment. In my opinion a high ECS can only be achieved by assuming a dramatic response of the West Antarctic Ice Sheet and a resulting albedo feedback, i.e. the Rahmstorf scenario. Unfortunately for the alarmists this is a science fiction scenario. The last time a comparable effect happened was when the Scandinavian and North American icecaps receded at the end of the last ice age, in a completetely different configuration. The Antarctican icesheet is surrounded by ocean and has been remarkably robust during all interglacials. High ECS is not supported by observational evidence during interglacials, the mere fact that ECS decreases at the end of glacial melting events is proof of an operating negative feedback, preventing runaway warming. a high ECS can be achieved by specifying a response [known] to CO2 doubling and then throwing in positive feedbacks such as increased water vapour, a two edged sword, but it is a distinct legal,mathematical and scientific possibility. The only problem for us skeptics is that the warming that should follow the CO2 rising is not happening. * A new paper led by a UK Met Office scientist claims that changing model input substantially increases historical estimates of climate sensitivity. This finding underlies the authors’ conclusion that previous climate sensitivity estimates based on observed historical warming are too low. *Results using the more recent dataset contradict their claims, largely due to differences between the two datasets in the evolution of sea-ice more than the effects of evolving patterns of SST change over the open ocean.The divergence shows GCM’s are highly sensitive to the SST and sea-ice dataset used. *the study also conflates two different temperature-change pattern effects, both of which affect estimated climate sensitivity in GCMs: The term “pattern effect” refers to the effect on radiative feedback, and on climate sensitivity estimates derived therefrom, of the spatial pattern of evolving surface temperature change. b. the spatial pattern when GCMs respond to evolving forcing over the historical period; The second pattern effect is caused by natural climate system internal variability. *Introduction (EffCS) based on observed warming over the historical period, EffCShist, have generally been in the 1.6–2.0°C range. ? EffCShist estimates for general circulation models (GCMs, also called global climate models) driven by historical forcing, which for current generation (CMIP5) models average 3.0°C . *A new paper (Andrewsetal18 “Accounting for changing temperature patterns increases historical estimates of climate sensitivity”. Is unjustified in the light of the simulation results reported by the authors. The types of simulation and related measures of climate feedback and sensitivity involved, the GCM simulations that they employ are driven by combined SST and sea-ice changes. Variation in sea-ice is an important element as it strongly affects local surface temperature and albedo, as well as having remote effects. The paper compares climate feedback with feedback over similar length abrupt4⤬CO2 simulations, in which CO2 concentration is initially quadrupled and then held steady (λ4⤬CO2). Thais conflates two conceptually distinct pattern effect issues. all six models show a noticeably stronger climate feedback lower EffCS – over the historical period with observationally-based SST and sea-ice evolution than when allowed to generate their own SST and sea-ice patterns in response to radiative forcing . *Andrewsetal18 claim in their title that accounting for changing temperature patterns increases historical estimates of climate sensitivity. 3 that the long-term SST and sea-ice patterns simulated by GCMs, and the radiative response to them are realistic. the key claim made in the paper is qualified as dependent on the assumption that point 3 is true. 1: There is Non-robustness to the observational SST and sea-ice dataset used Feedback over 1871-2010 nearly halves upon switching SST and sea-ice dataset from AMIP II to the newer HadISST2.1. There is no hint of these remarkable results in the paper itself. , results using the HadISST2.1 dataset are radically different from those based on the AMIP II dataset – the sole dataset used throughout the paper itself. 2: Differences the differences between their estimates of λamip and λhist are too large to be accounted for by natural internal climate system variability as simulated by CMIP5 models. if it is unrealistic, then is it reasonable to rely on the forced warming patterns that CMIP5 AOGCMs generate being correct? they restrict that analysis to two sub-periods over which the sea-ice trends in the HadISSST2.1 and HadISSST1 datasets are almost identical. However, over the full 1871-2010 period the HadISSST2.1 Antarctic sea-ice fraction trend is three times that in HadISSST1, whether or not 1970s data are excluded. * Andrewsetal18 shows that climate feedback strength in amipPiForcing simulations is greater over the historical period than in long-term CO2-forced simulations depending on the SST and sea-ice dataset used; results using the more recent, improved, dataset suggest not. different feedback strengths using the two datasets prove that the Andrewsetal18 main results are highly sensitive to the choice of SST and sea-ice dataset used . I therefore think it is difficult to draw any strong conclusions from the simulation results presented in the paper. If CO2 was doubled today and stayed at that level for a year. How high would the temperature be tomorrow, in one month and in 1 year? I felt the change in temperature for a x4 inst. forcing only goes up very slowly, years in fact to perhaps get to 2 C, then much longer to get higher centuries+ to get to an equilibrium . I am prepared to accept some lapse as the change in heating permeates to its final level. Perhaps a different simpler picture of a non rotating earth would help the imagery. Here the retained incoming heat would rapidly build up and then spread to the dark side over time, hours days until the outgoing again balances the incoming. Obviously some heat would be transferred/ building in the oceans. But this again could balance fairly soon. The oceans being hotter on the surface keep the air warmer and decrease rapidly the amount of heat needed to be put in to achieve that balance as well. Why should not the temperature reaction of a known composition adjust to that expected temperature, or close to. more quickly? That might happen if nothing else changes, but in a dynamic, self correcting system, everything else changes. Natural internal cycles deal with all kinds of external changes, those little things do not matter much. Real Question above displaying my limited knowledge. Does the atmosphere lose so much heat to the sea every day that it takes years instead of days to adjust to close to that due to the new x4 CO2 simulation? Surely at night the sea would be putting the heat back into the atmosphere. The amount of heat capable of being transferred into the ocean must be small compared to the amount coming in and going out of the atmosphere. Where has the physics that says PPM CO2 this level, temp that level gone? In light of the high range of temperature change possible in 24 hours of the atmosphere. Does it not want to heat up to it’s specified level? Although, as you say, the atmosphere responds very fast, it takes a few years for the surface ocean layer (the tens to low hundreds of metres layer that is mixed by wind and waves on an intraannual timescale) to reach equilibrium with the atmosphere. And since interchange of water and heat between the surface layer and the deep ocean is limited in most areas, it takes many hundreds of years for the deep ocean to come into equilibrium with changes in the surface ocean temperature, which it must do for the climate system to have fully adjusted to 4xCO2. However, a good part of the temperature response does occur within the first 10 or 20 years of a quadrupling of CO2. Large diurnal temperature changes are possible because on such short timescales the resulting heat flows do not penetrate far into the ocean – and of course over land the ocean’s short term influence on temperature is limited. The water in the atmosphere does regulate the temperature. When it gets too warm water evaporates and prevents more warming. When it tries to get too cold water condenses and forms clouds and/or fog and prevents more cooling. They use humidity to forecast this stuff. The water content does not let more or less CO2 make any difference. Does it not want to heat up to it’s specified level? YES, BASED ON THE AMOUNT OF WATER IN THE ATMOSPHERE AND NOTHING TO DO WITH CO2! Does the atmosphere lose so much heat to the sea every day that it takes years instead of days to adjust. The sun energy passes through the atmosphere and heats the surface land and oceans. The atmosphere gets heat from the surface. The surface IR passes out and does no heating of the atmosphere unless there is water, or water vapor or other greenhouse gases. Day and night, summer and winter, cloudy and sunny, the atmosphere adjusts quickly. It does not take days or years, it is more like minutes. When a front comes through, it is many degrees different when you cross the thin layer between the warm and cold air. Atmosphere is heated or cooled by the surface! I am really pleased that you have taken the time to offer a detailed review of the Andrews et al paper. I left my own brief comment on this paper on a previous thread, wherein I described the Andrews et al paper as “the full Chewbacca defence on steroids”. Your article, and particularly your analysis of the HadISST2.1 dataset, has caused me to revise my view on the solidity of the inferences which could be drawn from the Andrews et al data. Those inferences did not, and still do not, line up with the conclusions drawn in the paper, which I still find laughable. My conclusion on first reading of Andrews et al was that the paper presented unequivocal, dispositive, empirical evidence that atmospheric-model response to observed and prescribed SST and sea-ice fell so far outside the (tested) variability of AOGCM results (e.g. Dessler et al and your review of same) that we could now, once and for all, definitively consign AOGCM results to the dustbin reserved for failed models. Alas, your analysis of HadISST2.1 produces a fig-leaf to protect the AOGCMs. I know that it would have been so much easier for you to ignore this, and to write instead an article which demonstrated the lack of validity of the now-you-see-it-now-you-don’t condition in Andrews et al – “Assuming the patterns of long‐term temperature change simulated by models, and the radiative response to them, are credible…” Since I am certain that you are fully aware of the implications arising from your analysis, you merit congratulation and respect for your integrity and intellectual honesty in presenting it in this form. You also have my somewhat grudging thanks for tipping me off my pedestal of comfortable certainty. Nice to hear from you Paul. It does seem to me Andrews et al is just another one of many GCM defences, some more credible than others, against energy balance models suggesting relatively low climate sensitivity. It is by no means certain that the representation of Antarctic sea-ice in HadISST2.1 is more realistic than that in HadISST1 (and hence in AMIP II). It could be that there is indeed some pattern effect in GCMs during the historical period. But, if so, it seems more likely to me that it is largely forced rather than due to internal variability. To the extent that it is forced, the pattern effect would implicate erroneous simulation of warming patterns in AOGCM historical simulations, with possible implications also for their simulation of long term CO2 forced warming patterns. So you may turn out to be right that amipPiForcing simulation results are indicative of AOGCM faultiness. Well there is certainly ample reason to believe that AOGCM’s simulation of sensitive “patterns” like clouds or “warming patterns” are not valid evidence of anything. When you try to use a sub grid model on a grid of O(50) km, you have little chance to get even the averages right. Turbulence modeling has a 100 year history and its still often wrong out of sample. For atmospheric clouds and convection the amount of work done is much smaller and the first principle basis is much weaker. I am understanding from Angech’s comment that HadISSST2.1 Antarctic sea-ice fraction trend is three times that in HadISSST1. Can you or anyone elaborate as to why the large difference in the datasets in sea ice evolution? Is this variance well known to investigators like Andrews? And, since analysis that contradicts Andrews’s claims exists in Andrews’s own supporting document does this call for a retraction or revision? “Prior to the early 1970s, sea-ice area is estimated from sea-ice extent (which is taken to be where its concentration is 15%). Over the entire period, sea-ice extent decreases more in HadISST1.1 than in HadISST2.1. However, the opposite is true for sea-ice area (and fraction). In HadISST1.1, the relationship of sea-ice area to sea-ice extent is very different before and after the 1970s. In HadISST2.1, which uses a more sophisticated method of deriving sea-ice area from sea-ice extent, their relationship is more consistent before and after the 1970s. I am sure that this is well known to Tim Andrews, not least because the lead author (Holly Titchner) of the paper setting out the construction of the HadISST2.1 sea-ice dataset and how it differed from HadISST1 is one of his co-authors on the Andrews et al (2018) paper! Andrews doesn’t accept that the evidence in the paper’s supporting information contradicts the claims made in the paper. Ron, as the “famous JCH” poited out: There won’t be a retraction or something like this. AFAIK the publishing journal “GRL” does not allow any comment in reaction to published articles there. BUT: I’m quite sure that many members of the community read the post of Nic Lewis here and casting doubts on the “pattern argument”. At ATTP Steven M. found the spatial argument “obscure” after reading Nic’s post. So IMO the result is: The pattern-arument is retracted in fact if there is a formal retraction ( or revision or something else) of Andrews et al (2018) or not. In science there is a “vote by feets”: The paper won’t be cited because it’s demolished in fact. Frank, I would like to believe you were correct that climate science is that careful not to build on shaky foundations. But one must consider that the coauthor of Andrews’s study is a top authority on sea ice extent. Holly Titchner, who complied HadISST2.0, we would hope would not put her name to a study that ignores her work and is by expert account flawed in its methodology. But if this is bias this brings up another question: does Titchner bring her bias to her splicing together of all the various historical data that produce ice extent evolution? For those infrequent visitors to the climate blogs I am going to state some facts not well reported to the lay people. Nic please correct me if I’m wrong. 2) The historical weather station and sea data has been highly adjusted through the years in the hands those committed to a cause intimately connected to that data’s historical trend. I would venture to guess that 97% of the paper’s introducing a revised data set have been adjustments that make the warming trend steeper. It’s always “worse than we thought.” The exceptions are in satellite index mentioned. 3) The most obvious bias to the land temperature record is caused by the warming of land development and use creeping up over time around weather stations. The more the development the higher the temperature at the local reading. This is known as land use land cover (LULC), of which urban heat island (UHI) effect is the most noted example. The most used global land temperature data set, HadCRUT, does not adjust for LULC or UHI. Instead, weather stations that are found to be too contaminated by local heat sources to continue were systematically replaced by locations on the edge of town that were yet to be contaminated, to allow the (non-climate) warming cycle to repeat, and thus systematically exacerbating the bias in trend. 4) There are no models in the IPCC’s CMIP program that can simulate the centennial and millennial cyclical fluctuations that are seen in the thermometer record or in the temperature proxy record (of the last 10 thousand years). Thus, there is no certainty that the upward temperature trend of the last 150 years is not partially a continuation of the natural trend since the Little Ice Age temperature bottom seen approximately 350-400 years ago. 5) Lewis and Curry, and other observational climate sensitivity to CO2 studies, base their energy budget model (EBM) on IPCC data, like HadCRUT (and not UAH). And, the models assume that all warming trend is due to IPCC “known” forcings. If part of the warming is is caused by unknown forcings, or is unforced centennial scale variability, or is biased by LULC, then to those extents sensitivity to CO2 has been erroneously inflated. One other large unknown forcing is the man-made and volcanic aerosols, which have a cooling effect. The IPCC says the forcing is a lot and thus CO2 is a lot to overpower them. But if the aerosol forcings a half, (which many believe,) then CO2 has that much less warming power. Lewis and Curry and EBM studies assume IPCC forcings are correct yet they still come up with a CO2 warming power that is 1/3 less than that of the IPCC CMIP model mean. 6) That EBM based studies, like Lewis and Curry (2018), not include any assumed recovery from the Little Ice Age LIA is not a necessary constraint. To impact EBM calculations lowering CO2 sensitivity even more all that would be required is for the IPCC to sanction a study that determined the existence of a significantly negative Earth energy imbalance at the start of global records, ~1860. It makes sense that the coolest several hundred years in the last 10 thousand would cool the oceans, trapping in a negative imbalance, lightening the forcing required by CO2 to rebound warmth. Imagine measuring the force required to swing a pendulum but not knowing at what point of the swing your data started. The IPCC assumes that 1860 the pendulum was merely at rest. Do we need to know why the LIA happened to know that it cooled the oceans? And this paper https://agupubs.onlinelibrary.wiley.com/doi/abs/10.1002/2017GL076649 shows that the “patterns” are shortcomings of models which are simply extrapolated into the future. The last paper relating to “patterns” is dubious in the light of Nic’s findings. Taken the thinks together it seems that the “pattern” argument is dead and gone. Changes in the ocean in RETRO do however appear to affect the time-scale of equilibration. Dead and gone? No way. You clowns are funny. Yes Frank, I agree there will be no retraction or correction. My first hand experience with having found an egregious error in a prominent paper was that senior scientists said roughly: “So there is a series of papers out there that are wrong. People will eventually figure it out.” I believe this is really one of the problems with science generally. There are almost never corrections or retractions except in cases of egregious misconduct, such as making data up. Dishonesty is almost never punished either. Salesmanship in your papers is also rewarded too much by peers. There’s a hole in our story, dear Liza, a hole. The model don’t fit the data, dear Liza, don’t fit. So change it dear Henry, dear Henry, change it! Change the model or the data, dear Liza, change what? Change them both you dumb redneck, dear Henry, change both. The story is BS, dear Liza, BS. I just started reading this posting. “based on simulations by global climate models” always makes all of it suspect of fraud. Based on simulations is a red flag! I will read more, but I know how this is going down. Pingback: Empirical Evidence Shows Temperature Increases Before CO2 Increase in ALL Records | Watts Up With That? In an analysis that I have done on observed and CMIP5 modeled GMST series over the historical period, I have run across a dilemma that while known by me before doing this analysis was reinforced by the results of my analysis. Here I will not present details but rather give the general methods and results. I have been attempting recently to determine whether a series decomposition method for resolving a series into trend, periodic variations and noise could extract a trend from the above noted series that was well correlated with the observed forcing as listed in AR5 and extended in Lewis 2018. The method used is called Complete Ensemble Empirical Mode Decomposition with Adaptive Noise (ceemdan). The ceemdan trends extracted from both the observed series of HadCRUTv5 and Cowtan Way infilled HadCRUT and the CMIP5 series all had excellent R^2 values (averging around 0.95) when regressed against the AR5/Lewis observed forcing series where the forcing series had either the volcanic forcing excluded or smoothed over a longer forward period. The CMIP5 GMST was constructed using a combination of the ocean tos series (SST) and tas series for land (SAT) so that the observed and model comparisons are oranges to oranges. The regression of the ceemdan trend series versus forcing series was used to obtain an estimate of TCR in the method used by Gregory in the paper, “Transient climate response estimated from radiative forcing and observed temperature change”. The TCR mean value of the CMIP5 models was very nearly the same as that obtained for the observed GMST series and also the values derived in Lewis 2018 for the observed series noted above. Now the dilemma comes from the observation that the TCR values, and although not calculated or presented here, the ECS values as well as determined here are much smaller than those determined using the standard methods of the 1% CO2 and the abrupt 4XCO2 experiments from AR5. In the Forster paper, “Evaluating adjusted forcing and model spread for historical and future scenarios in the CMIP5 generation of climate models”, values derived using ERFs from regression of N versus T in the 4XCO2 experiment are held as sacrosanct and thus in a 2 step process are used to derive the (widely varying) forcings of the CMIP5 models for the historical and RCP scenario series. In other words, the GMST results for the historical period, being on average much the same as the observed, are resolved not by questioning the results of the 4XCO2 experiment but rather by assigning each model a different forcing series for the historical period based on the results of the 4XCO2 regression and with series that are for the most part very different from those for the observed forcing series and for that matter different from model to model. I have seen this seeming dilemma of similar temperature series during the historical period for the observed and model ensemble mean with very different derived sensitivities discussed in somewhat different terms but without any good explanation. Another related dilemma, at least in my eyes, is that the ratios for the ECS to TCR values derived from observed data are significantly less than that for those derived for the mean of the ensemble of CMIP5 models and I judge primarily from the differences in changes in heat content of the oceans during the historical period. It is fairly clear that forcing varies substantially between CMIP5 models. That is particularly the case for composite hitorical period forcing, where the level of aerosol forcing varies by a factor of over 4 (from ~ -0.35 W/m2 to beyond -1.4 W/m2). But CO2 (and presumbly other GHG) forcing varies substantially too – see Brian Soden’s paper(s) about this. The main reason is likely to be over-crude radiation code in GCMs, used to speed up computations. In abrupt4xCO2 and 1pctCO2 simulations one doesn’t need to know what the forcing from a doubling of CO2 (F2xCO2) is to estimate ECS or TCR, but when estimating them from historical period warming F2xCO2 is required as a multiplicative factor. Agreed re the ratio of ECS to TCR being higher for CMIP5 models than observations. That is another indicator suggesiting that their ECS values (or at least their effective sensitivities derived over the historical period) are too high. Nic, what I found most interesting in my analysis was that the ceemdan extracted trends for the observed and CMIP5 ensemble model mean – where the ocean part of the model global series used tos (SST ) and not tas – have very nearly the same values and further correlated very well with observed forcing. In order to obtain those close values, the forcing for the models with an on-average much higher TCR and ECS values than those published for the observed using the energy budget model, and as derived for the models from 1% CO2 and 4xCO2 experiments, had to be much lower in values for most of the models than that in the observed case. What is difficult for me to get my head around is that the derivation of the TCR and ECS observed values requires information on forcing from these same models. If the observed derivations were independent of the models I would have a clear understanding of the results of my analysis, but I do not see that as the case. Nic, the link to a summary of what is very uncertain concerning forcing and temperature responses to it coming out of CMIP5 and going into to CMIP6 appears to me to point to some of the questions I have posed. What is your view of this paper? “The extent to which the varying responses in CMIP3 and CMIP5 historical simulations were due to differences in effective radiative forcing among models, as opposed to differences in feedbacks, remains unknown. I am not sufficiently knowledgeable is this area, but the following excerpt would appear to me to put the forcing used in historical period on a footing more independent of the AOGCM models. I am wondering how much the results of the works published on determining the TCR and ECS values from observed data using the energy budget model has motivated the planned experiments in this paper. I think that in CMIP3 and CMIP5 there was an excessive focus on meeting ‘political’ requirements – projecting future climate change and showing that models could reproduce past changes and the current climate, with experiments designed to advance understanding of the science (and of the models themselves) getting less emphasis; CMIP3 didn’t even have abrupt 4x or 2x CO2 runs. After CMIP5 had been carried out it was realised that failure to diagnose forcing in historical and other simulations was a major barrier to understanding model performance in those runs, and also that there was far more difference between models in forcings that should be very similar between models – CO2 and other GHG. RFMIP is, I think, intended to remedy this for CMIP6 models. I’m not 100% convinced that fixed SST simulations are the best way to diagnose ERF, but they do provide precise (if possibly biased) values. Ron, the link I gave above was co-authored by Forster. I had read the material in your link and the Forster excerpt previously. I do not know whether Forster had a change of mind between papers or if he was just pushing an urgency in order to get cooperation from the modeling groups for CMIP6. In the general case of observed energy budget model and the CMIP5 models the models would have to have had much lower forcings during the historical period in order to emulate the observed global temperatures – on average – given their larger TCR values. The feedback constant could be a factor but it did not appear to be in my analysis that I reported up thread. The Forster papers are talking about differences between models and not models and observed. Ken, If you don’t mind I would be interested in what your interpretation is of Forster’s comments in 2013 versus 2016. To me it seem he is neglecting the variable of climate feedback in 2013, while neglecting aerosol forcing in 2016. Or, is he inferring uncertainty in AF when he talks of uncertainty in ERF since the GHG forcing component of ERF is assumed to be known? This is how I read it since AF and climate feedback are the two biggest unknowns. As for the difference in model ECS and effECS, it must be due to differences in the assumptions about ocean heat capacity. The models must be assuming a higher one since the TCR (which omits ocean heat factor) is more nearly the same for GCMs and EBMs. Right? This brings up the point that TCR is actually the more relevant metric for policy considerations. But that’s another day. Nic Lewis would be the best participant here to answer your queries. The excerpts from Forster’s papers are nuanced to a degree that makes it difficult for a layperson to interpret. In the one link he is saying that there is no evidence that the modellers intentionally used aersol forcing to make the modeled and observed global temperature changes for the historical period fit better. That does not mean the aerosol and other forcing differences did not come into play in the approximate matching of model to the observed historical trends. The paper implies that the existing spread in trends between models and the observed trends would not exist if the modelers were really attempting to approximately match the observed trends. That is a very weak implication in my book – but then I am not suffiently informed in how easily a modeler could use aerosols forcing or other “adjustments” to match the observed, and how informed the authors of this paper are on this matter. My interest in these matters is more about the difference in forcing, delta F, between the observed and modeled cases. The Forster papers in my readings do not directly address this issue but deal with models rather exclusively. I believe that Nic Lewis finds value in the ECS or effECS metric, but some other climate scientists, like Isaac Held, prefer TCR and I think judges the ECS derived value too uncertain and complicated or at least that was my impression from reading Held’s blog from years back. There are a number of blog participants here, including Nic Lewis, who have posted at Held’s blog that might want to comment. Differerences in models between effECS/EffCS and ECS appear to be primarily due to changes over time in patterns of SST warming. That is related to deep ocean heat uptake, but does not imply that total ocean heat capacity is a factor. It is certainly true that TCR is the most relevant parameter for predicting warming this century. Sea level rise is more affect by EffCS, since the excess of EffcS over TCR reflects the amount of heat going into the ocean. Any difference between EffCS and ECS, within the range in CMIP5 models, would make almost no difference to warming this century (or the next, for a typical CMIP5 model). I would certainly agree with the view that ECS itself cannot be estimated using the instrumental record alone, but I think useful bounds can now be placed on EffCS using it, as was done in Lewis & Curry 2018.
i think a more appropriate abbreviation for atomsk’s sanakan would be plain old sks.would make it easier to follow replies to comments. Good to see Nic Lewis prepared to comment at ATTP and set the record straight. Selective auditing of which models to use in a study is a fraught field. All the models ran on similar ideas, some would obviously not match the observations, only luck of the draw that some did. The dynamics of the majority of the models did not change, did they? The best way to settle it would be to do a run of all models and get the true all model ECS, obviously a lot higher and quote that as a comparison to what this small subgroup of models did. Even so the fact that for a small subgroup the outputs were lower than expected on the short run does not make up for the fact that they all will go up higher than observations when run for any length of time. I would have liked Nic to make some comment on changing the 12 to 48 times a year input recalculations and if in his opinion this would cause an increase in the expected rate of warming and a higher ECS. He did set the record straight. No need to get narky. Which in my opinion should lead to a greater rise in the overall ECS result due to the extra compounding this introduces to the temperature calculations. But I am told this is wrong by the, in my opinion, knowledgeable mathematicians there. When my first hydrodynamic model went mad – my thesis supervisor knew what to do. I’m not sure that JCH knows what to do. I just found this on leapfrogging interesting and informative. Thank you both though the fundamental thrust of my assertion is not answered yet. “The time-stepping scheme that is widely used in weather and climate models is the second-order centred-difference scheme, which is affectionately known as the leapfrog scheme. It is widely used because it is easy to implement, computationally inexpensive, and has low run-time storage requirements. Unfortunately, in addition to the physical solution of the governing PDEs, the leapfrog scheme also admits a spurious computational mode that is manifest as a growing 2-delta-t oscillation”. This seems to suggest that I might be right in saying taking smaller time steps to reset the temperatures (and integrating different time scale dependent factors at each time step) will lead, in a similar fashion to compound interest increases, in a slightly higher ECS over time. Robert your addition is useful as well. Would still like a more definitive knockout of my assertion from anyone here. Would it be worth asking Lucia? No. Generally, if a solution routine is “consistent” and “stable”, then reducing timestep size will reduce local estimation error. It doesn’t always improve global error, but we generally expect/hope that it does. (Local and global here refer to the local point estimation in time and the overall accuracy of the converged solution against the true solution.) The equations which Philip Goodwin seeks to solve represent a very simple system, and there is no reason to believe that cutting timesteps should increase error propagation – quite the contrary. The “2-delta-t oscillation” which you mention arises from explicit ( forward difference methods) and semi-implicit methods (such as leapfrog solutions) when it is necessary to project past the point in time when a time-derivative needs to be evaluated. The projection can (very often) result in a succession of estimates which first undershoot and then overshoot the true, or at least converged, solution, thus giving rise to an oscillation of periodicity equal to twice the timestep length (2-delta-t). A solution routine may still be considered mathematically “stable” even when such oscillations occur. Cutting the timestep will often still leave the problem of this “2-delta-t oscillation” but it will have a higher frequency/lower periodicity and a smaller amplitude than before, hence less local error (again, assunimg “consistency” in the numerical formulation) than with the larger timestep. If such oscillations are very prominent or growing in time, the best solution is to change out the solution routine for a fully implicit formulation or a higher order scheme, either of which may allow convergence and stability at longer timesteps, but often at the cost of greatly increased computational overhead. I hope that this clarifies. 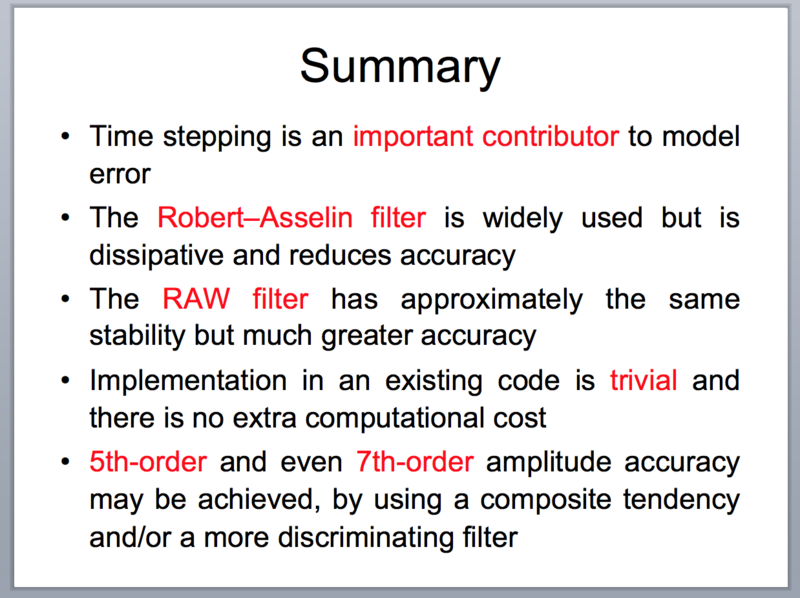 There are major problems with the Goodwin paper, but the timestep selection is not one of them.